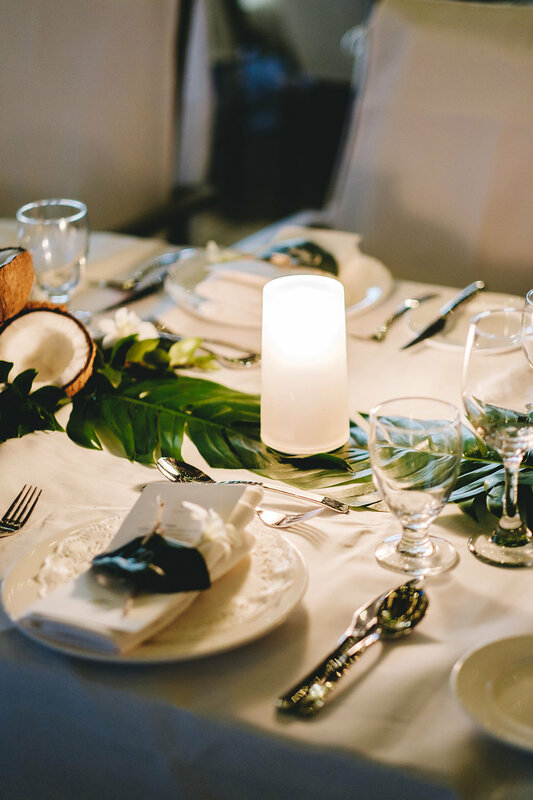 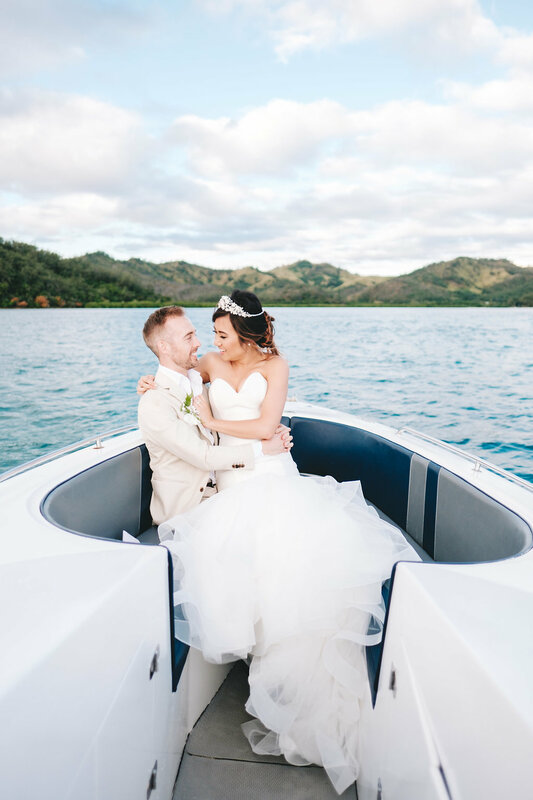 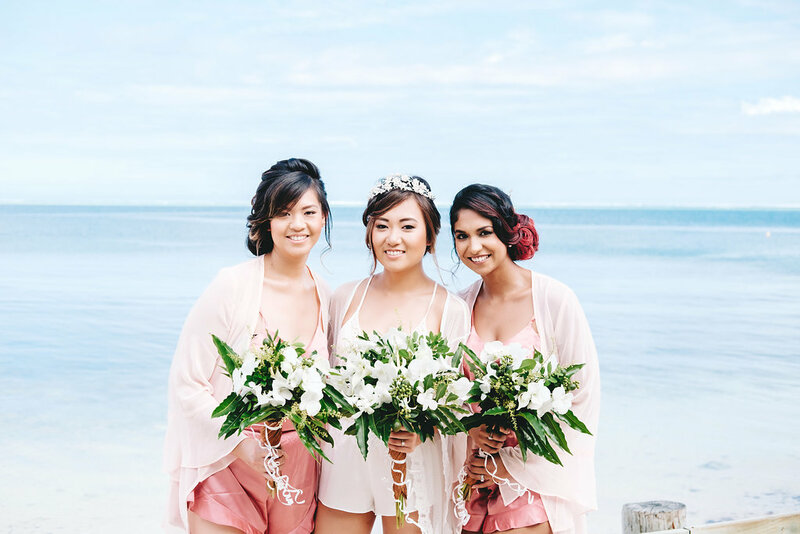 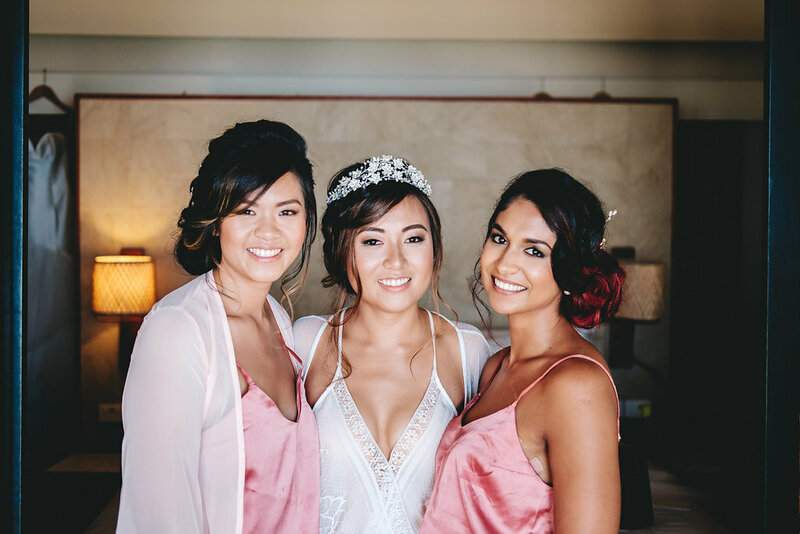 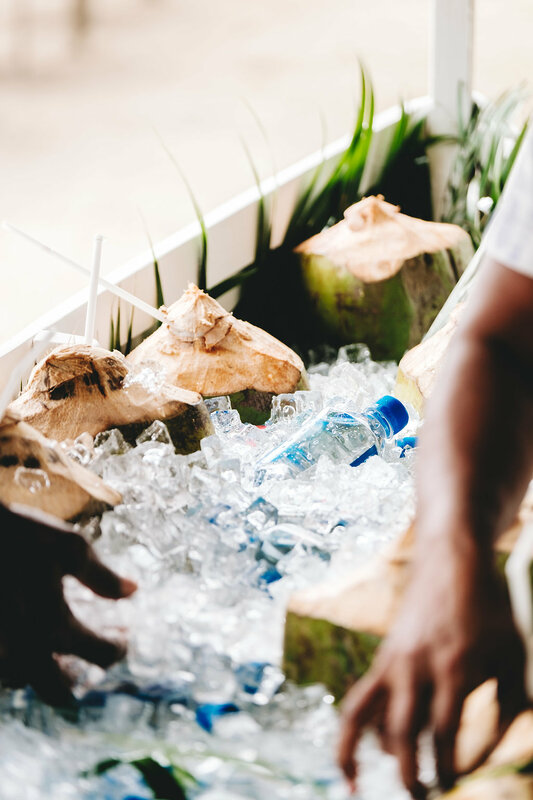 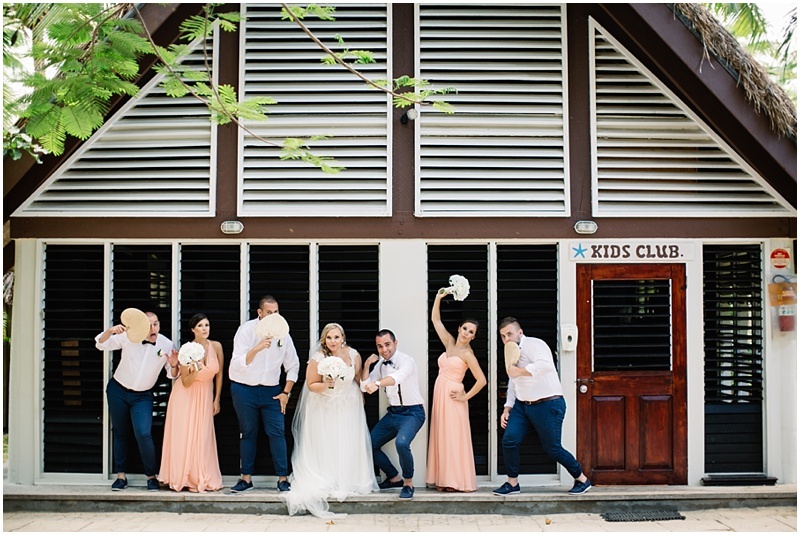 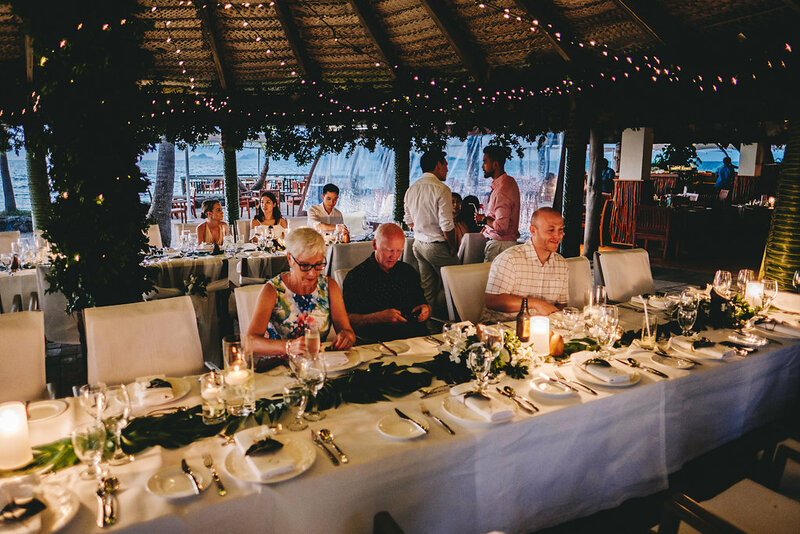 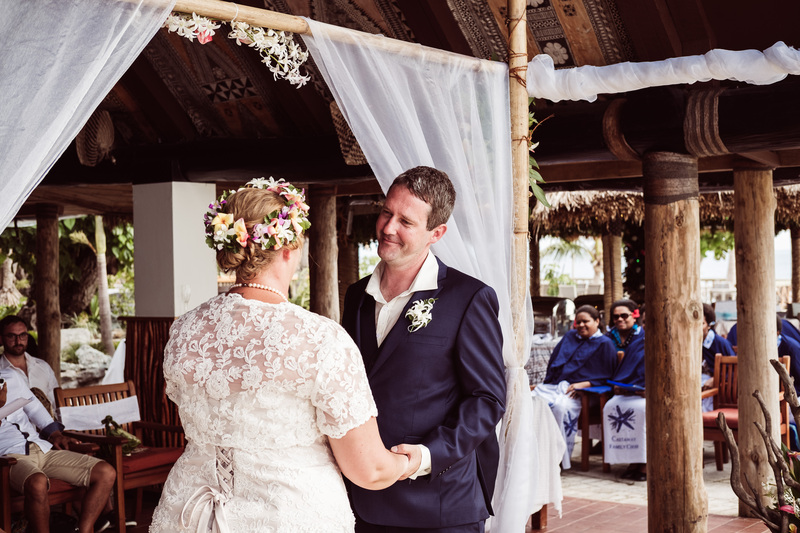 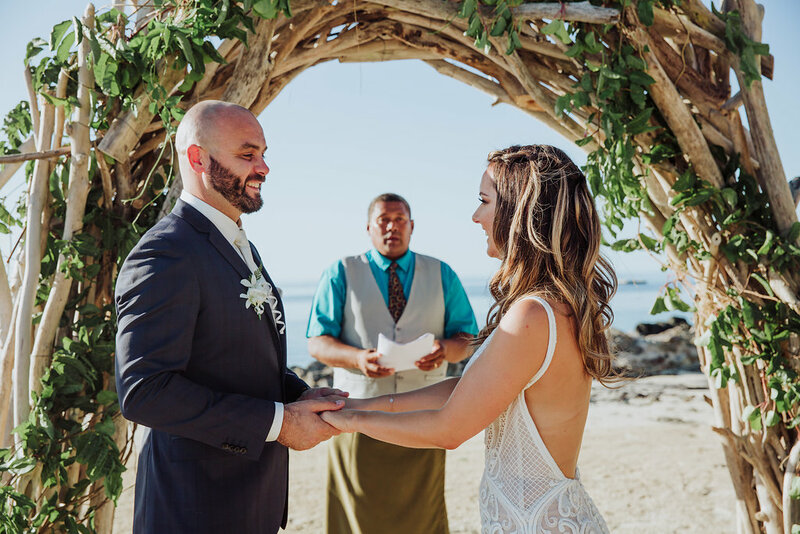 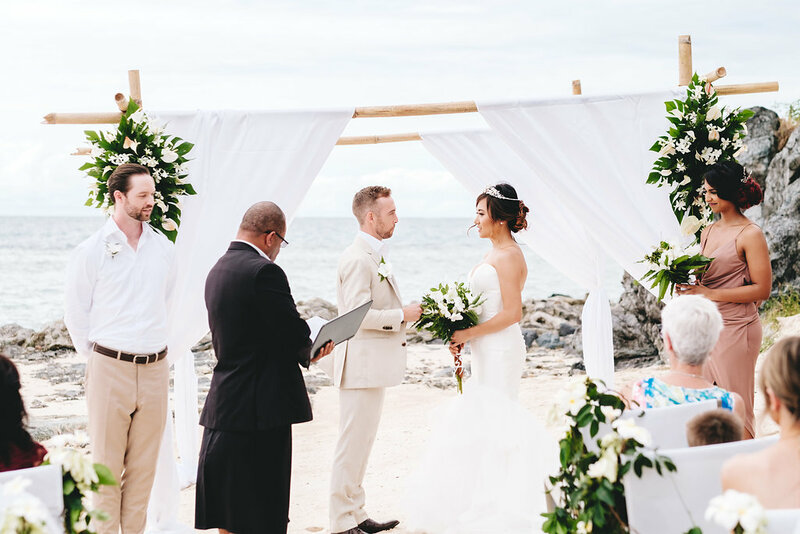 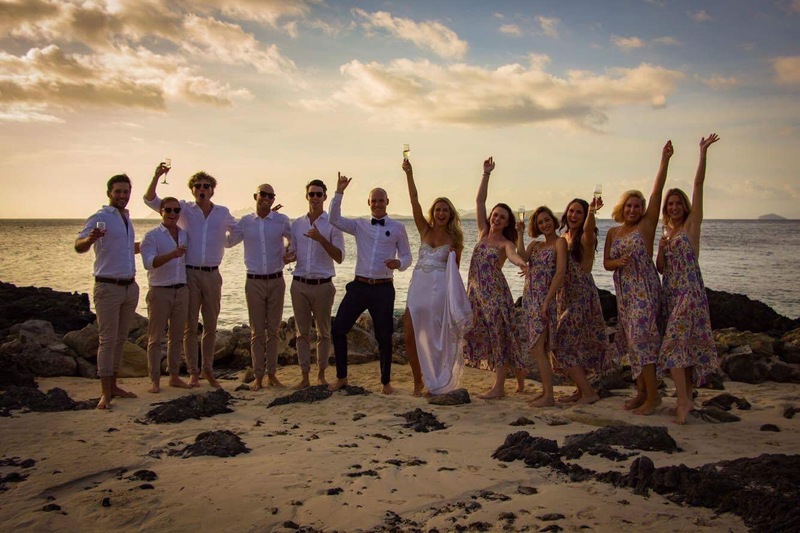 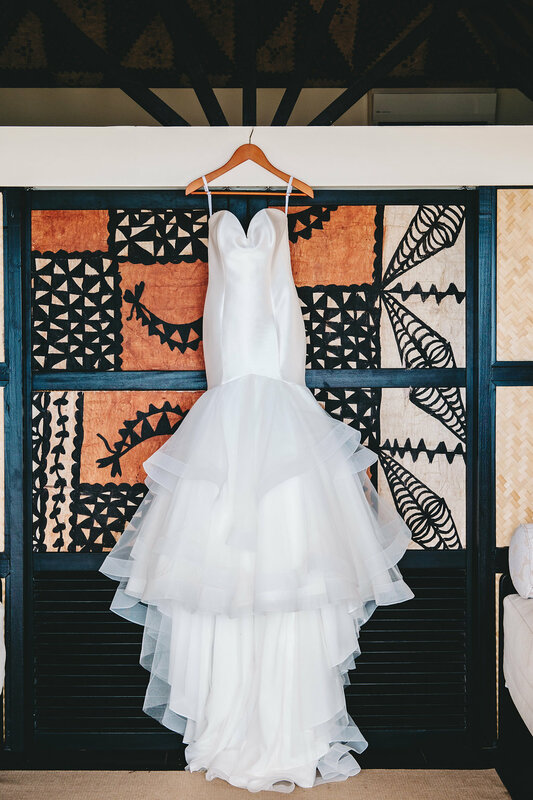 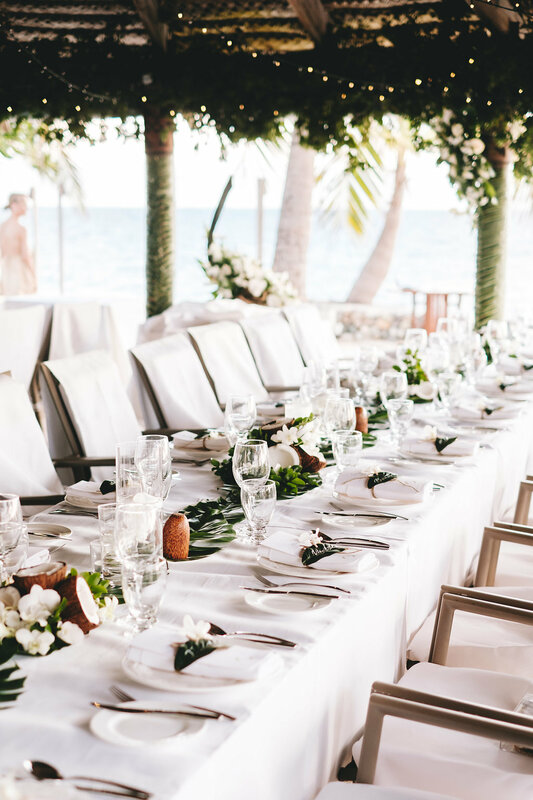 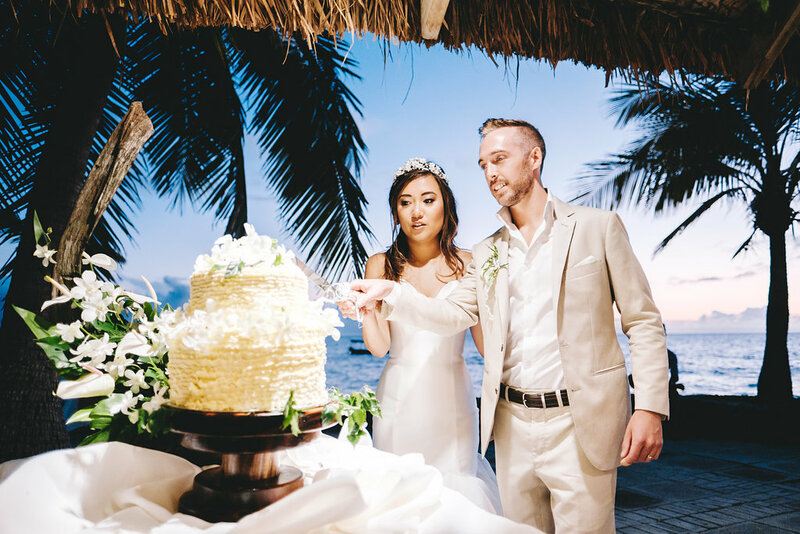 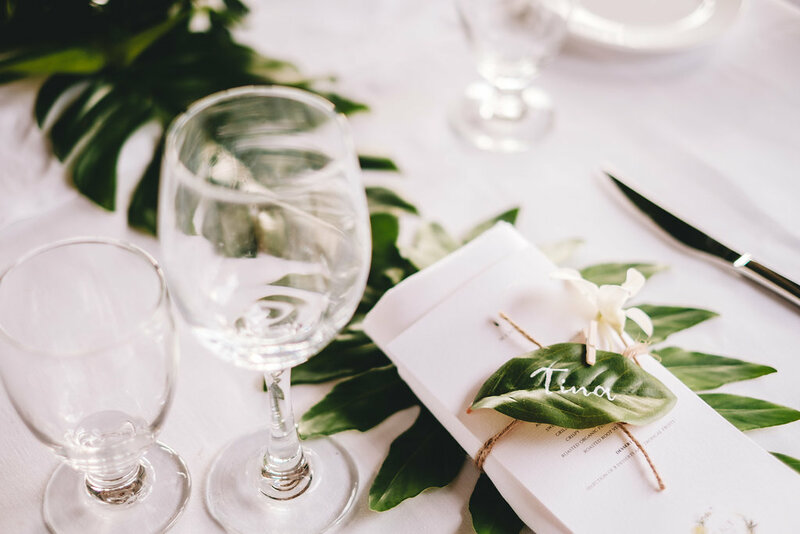 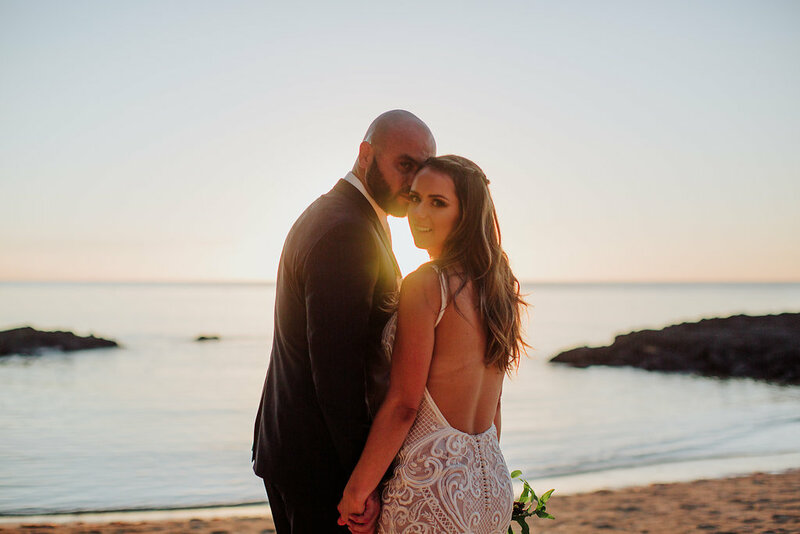 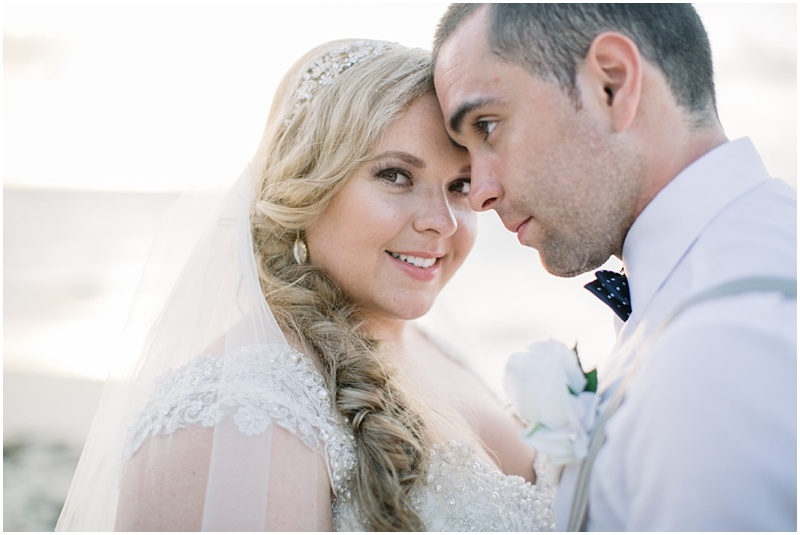 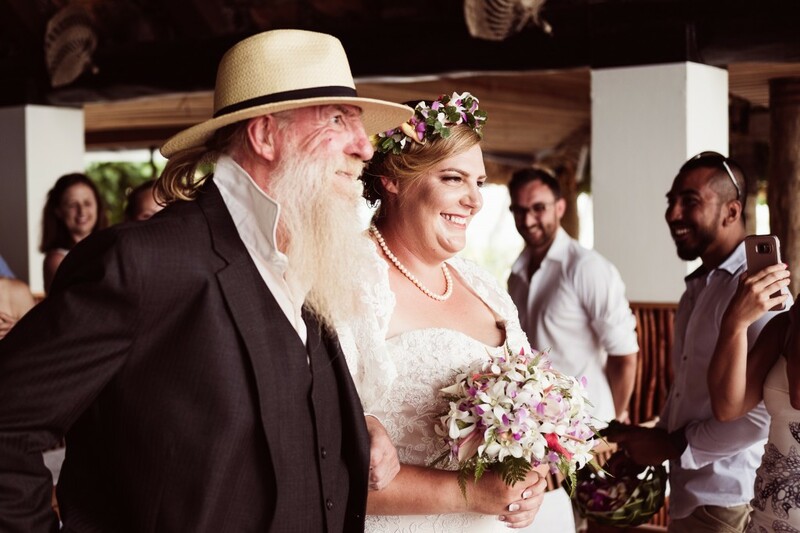 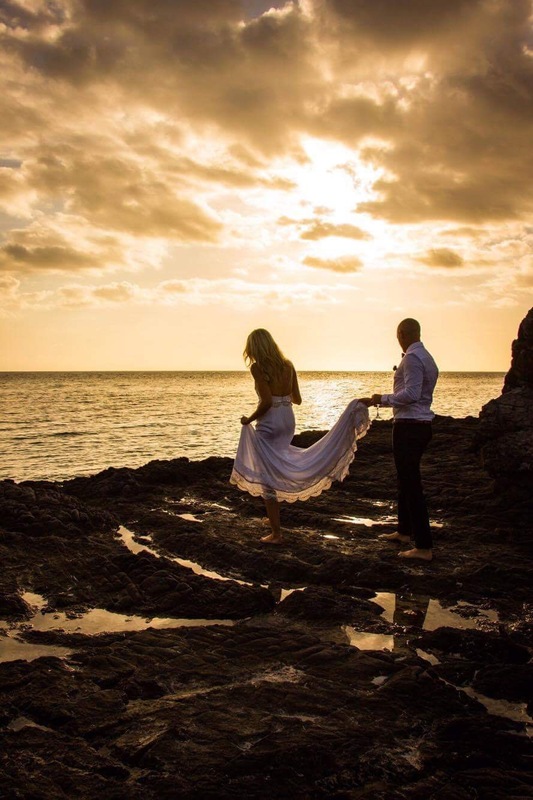 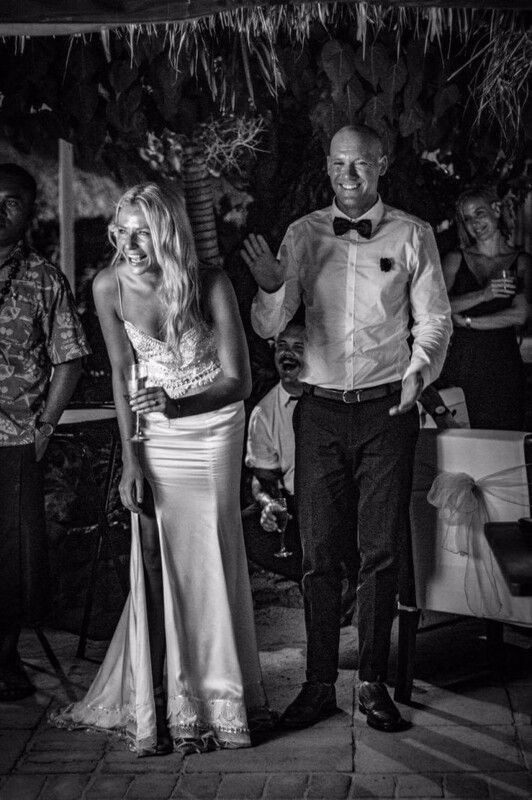 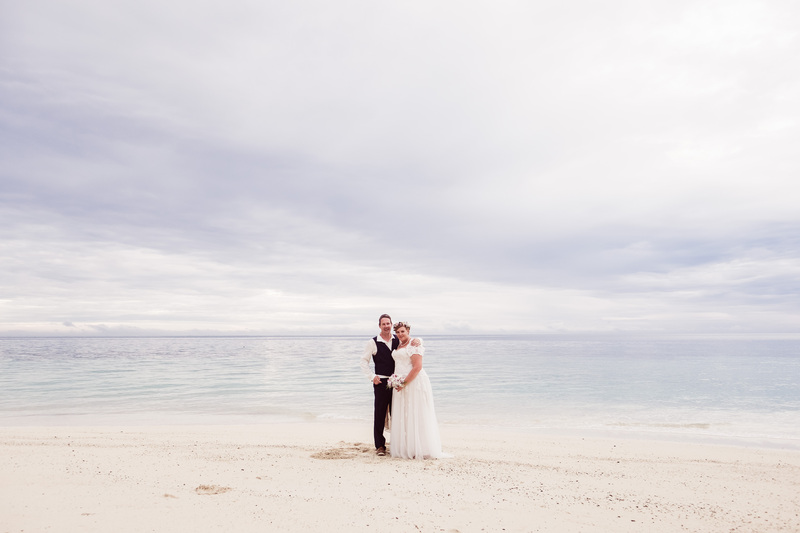 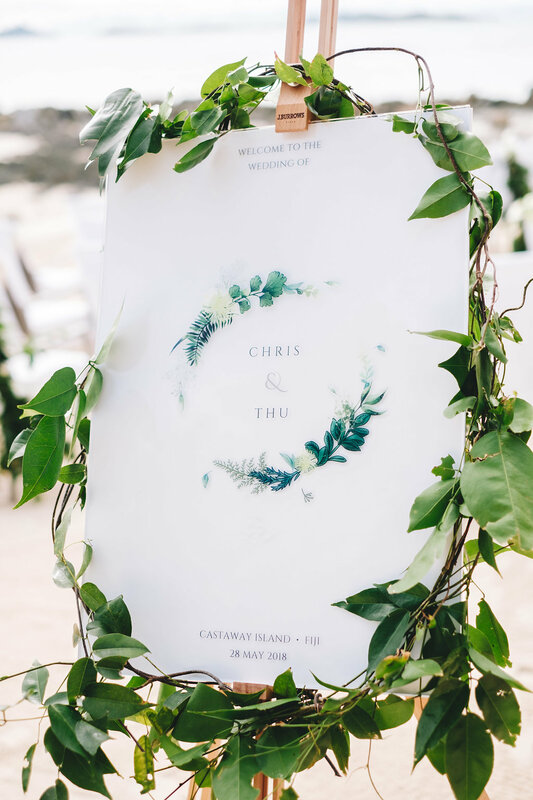 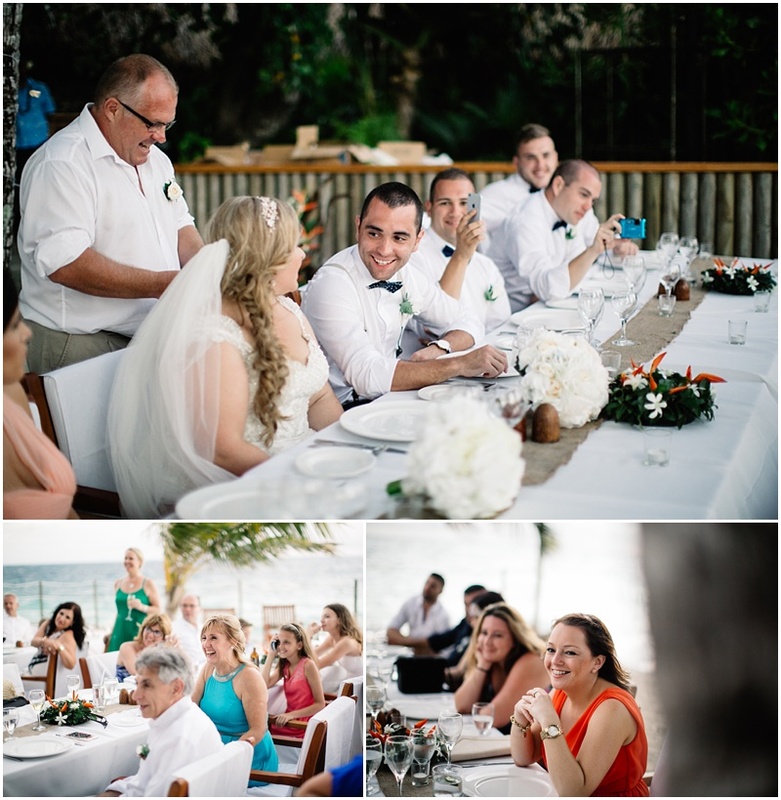 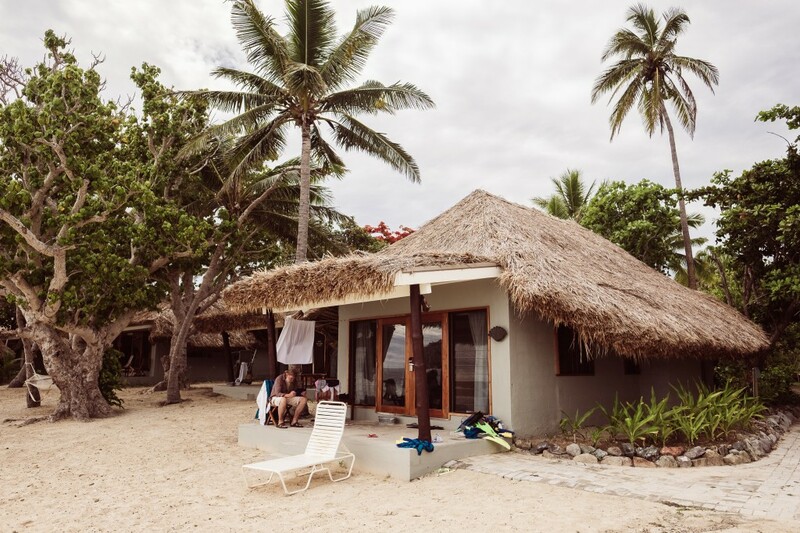 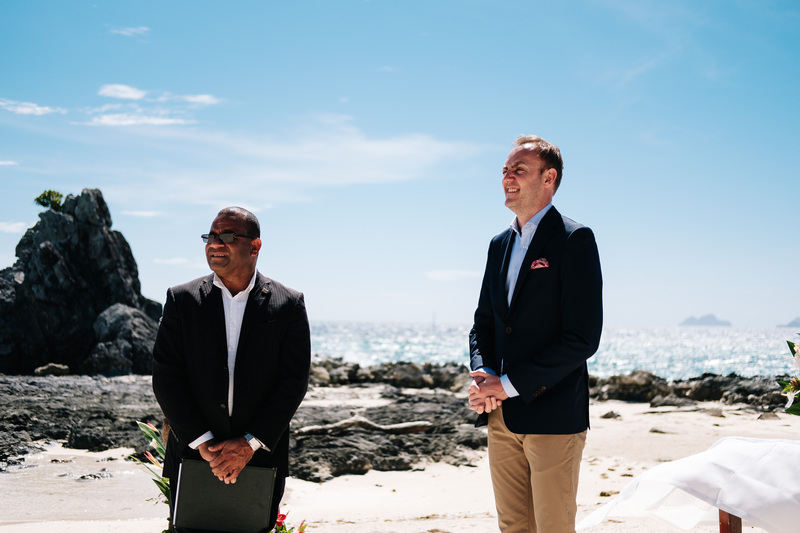 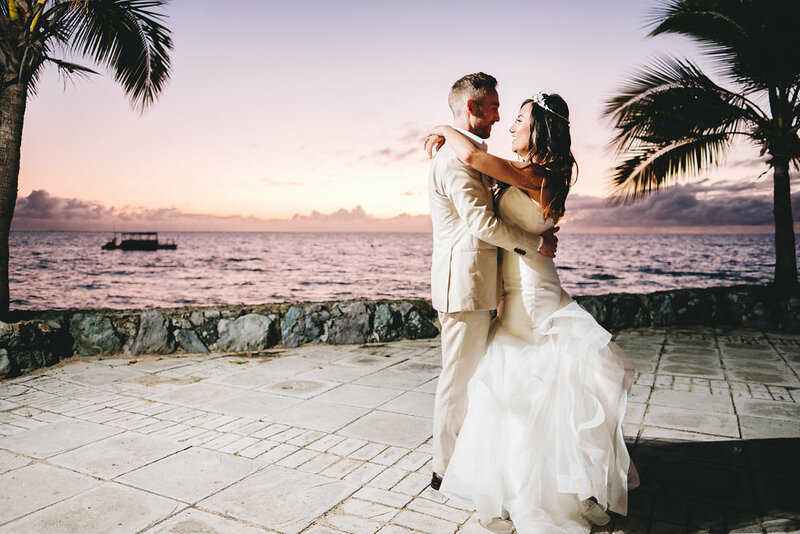 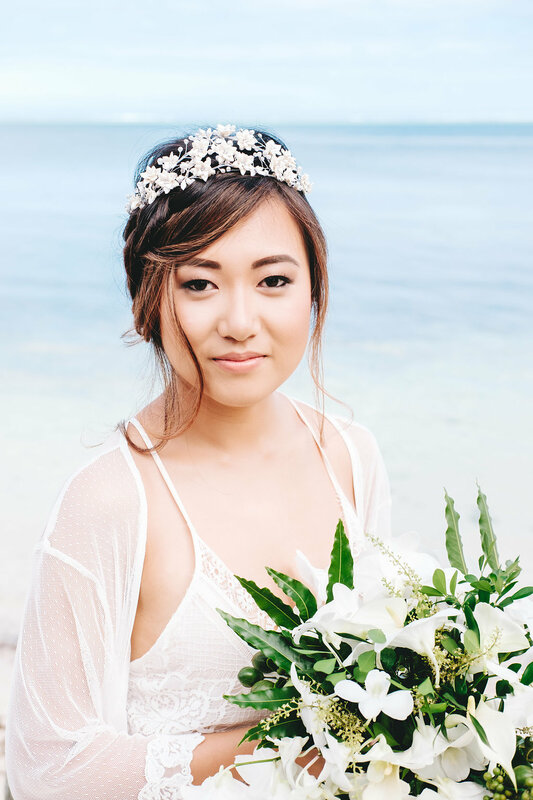 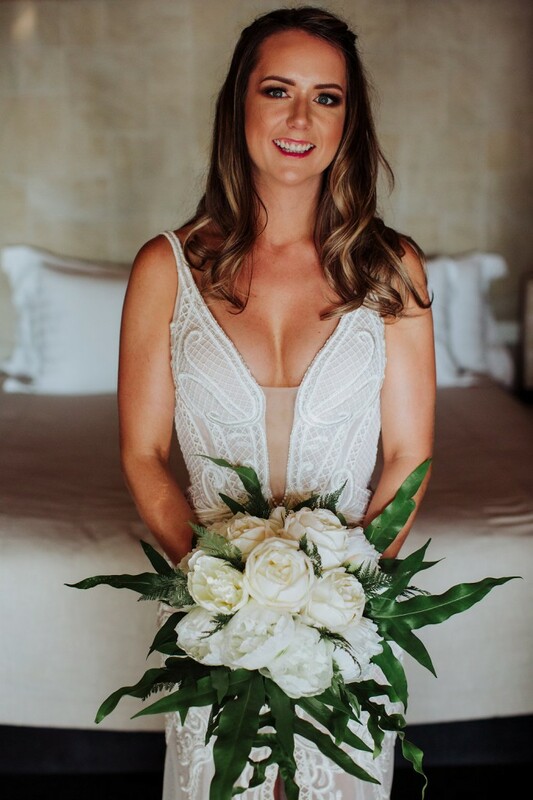 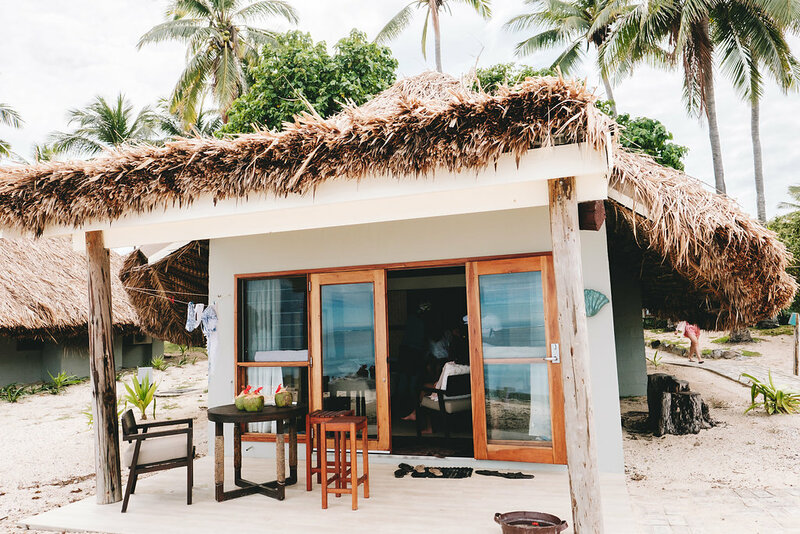 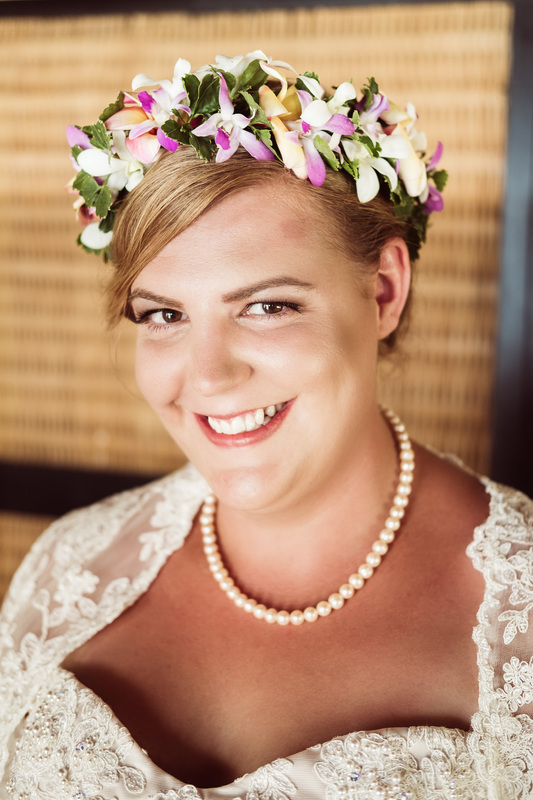 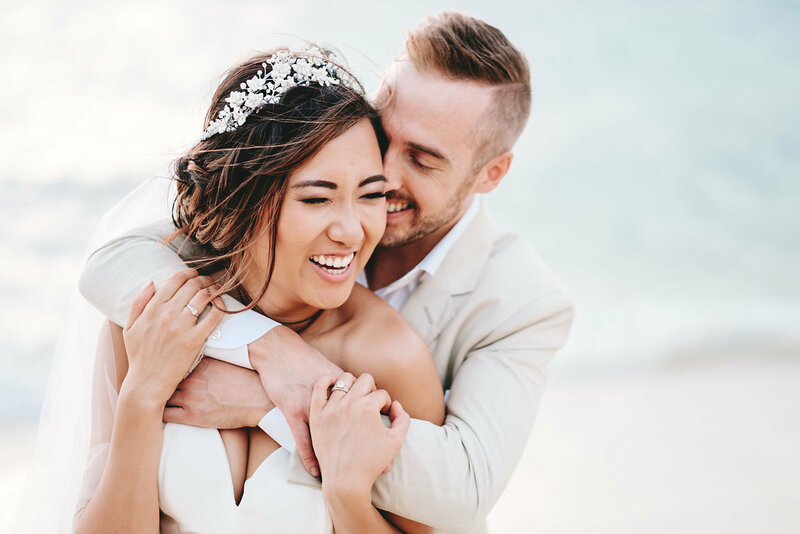 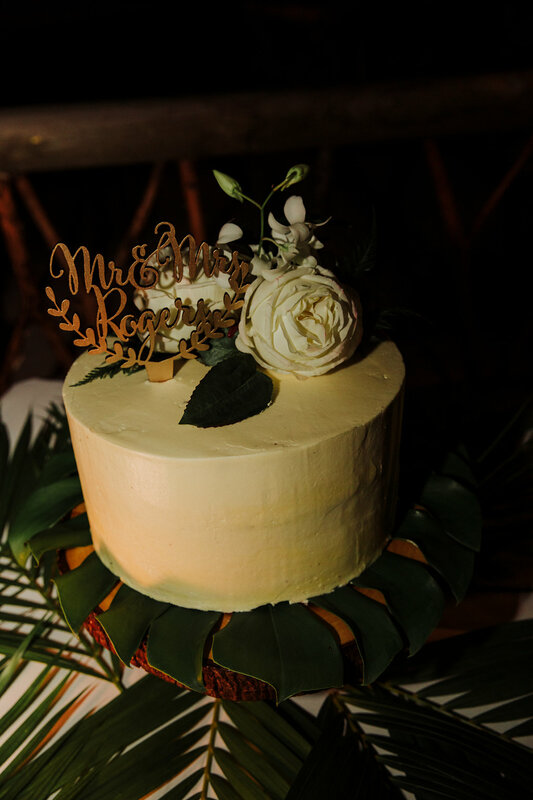 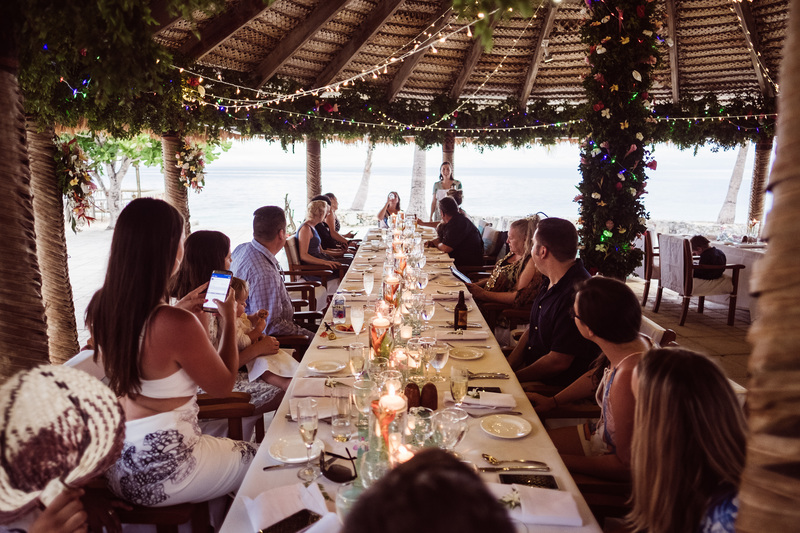 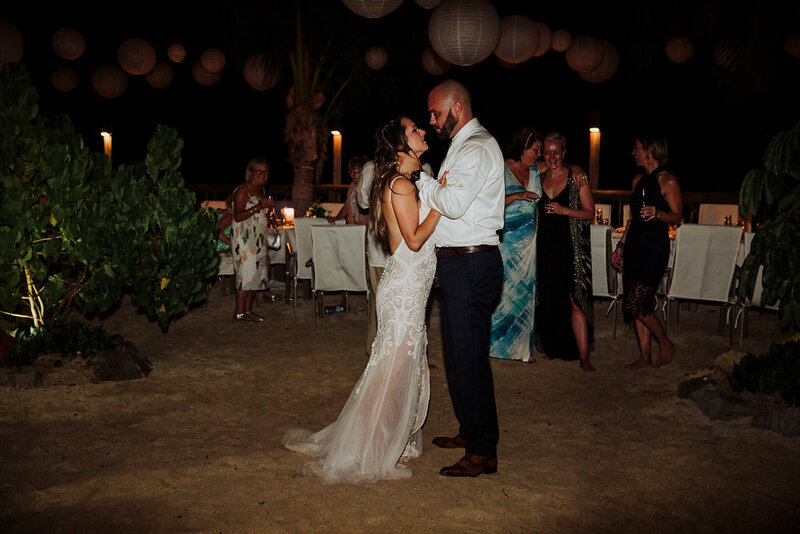 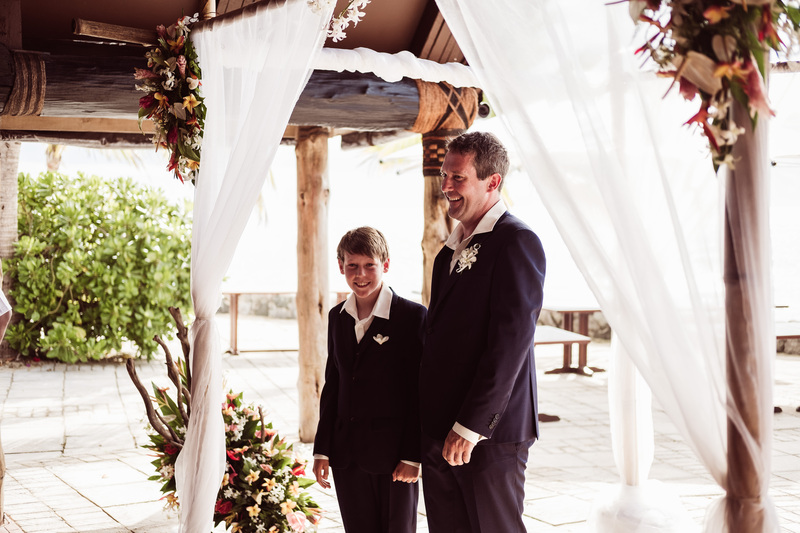 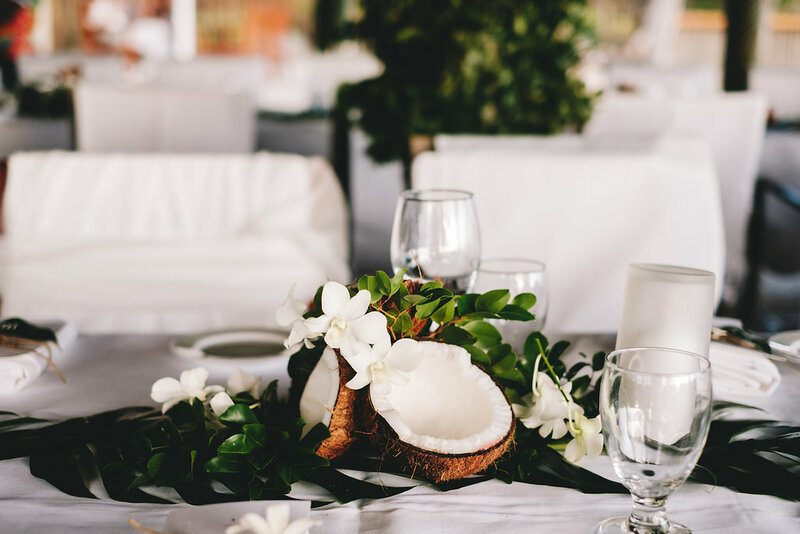 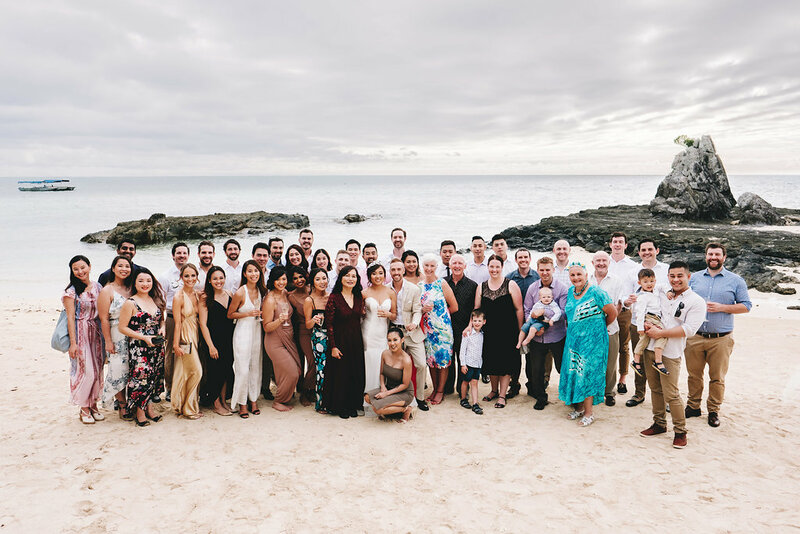 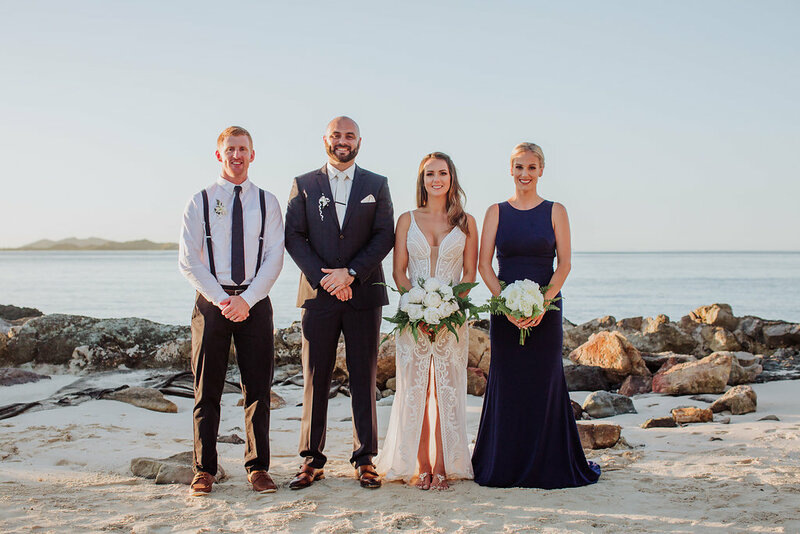 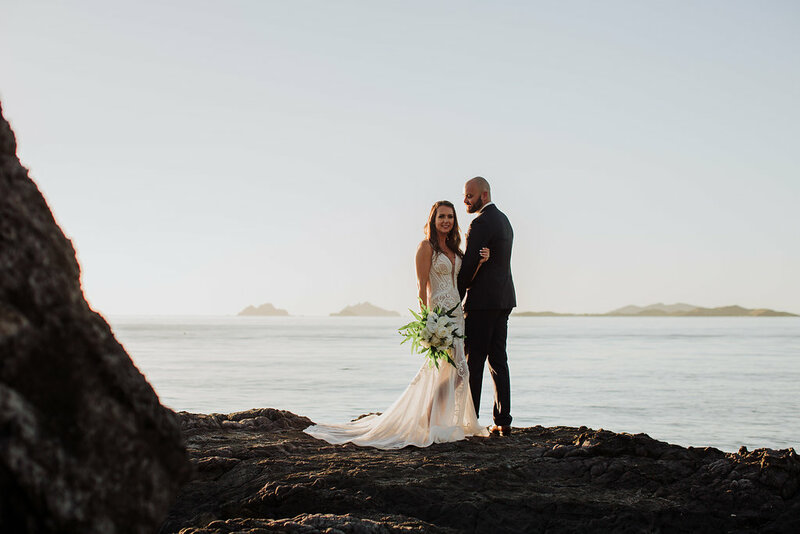 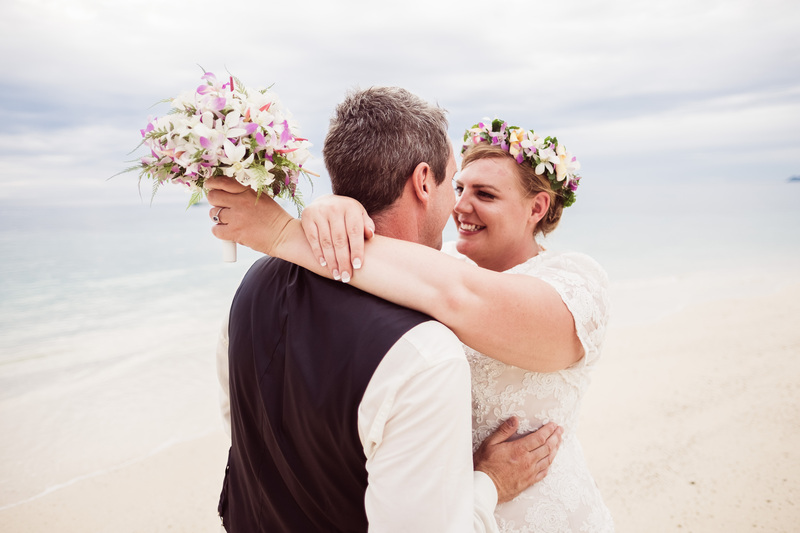 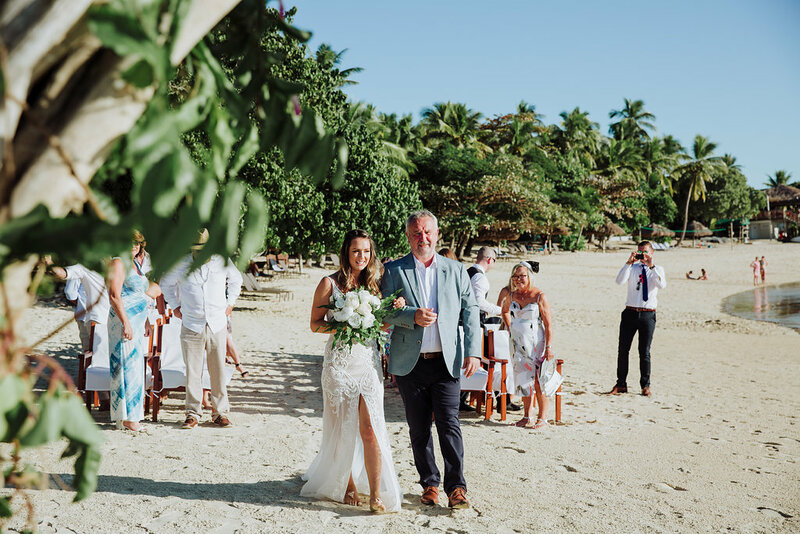 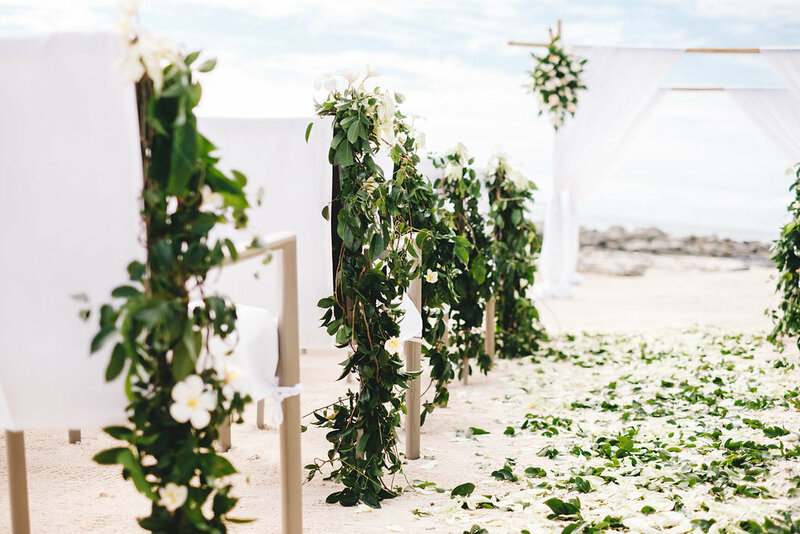 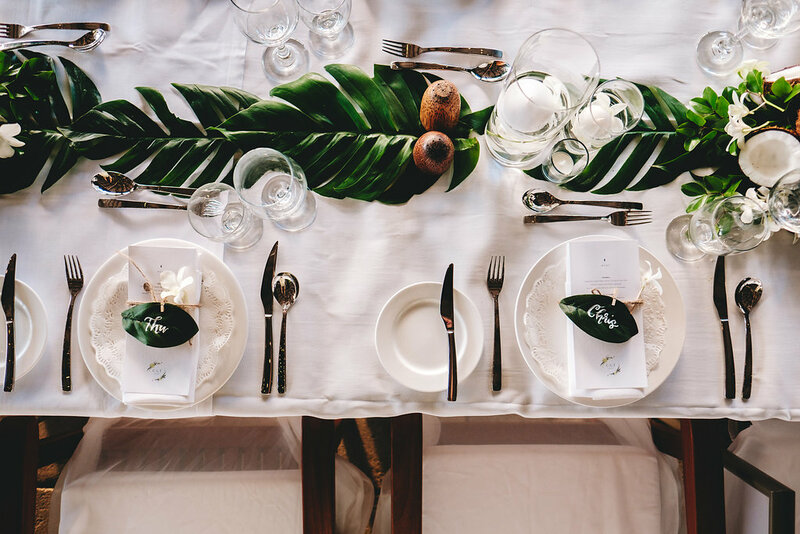 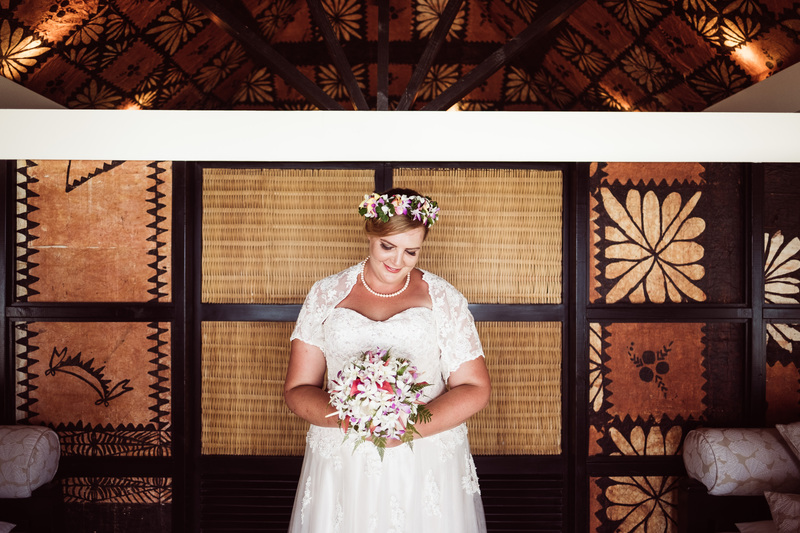 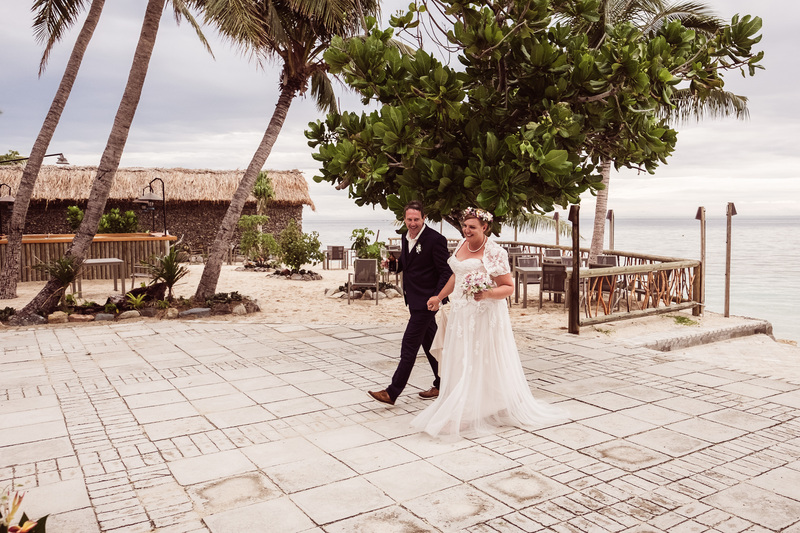 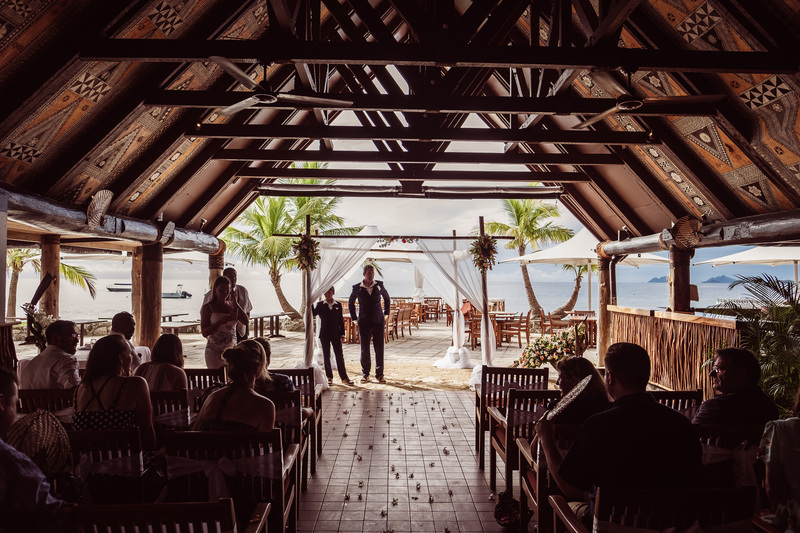 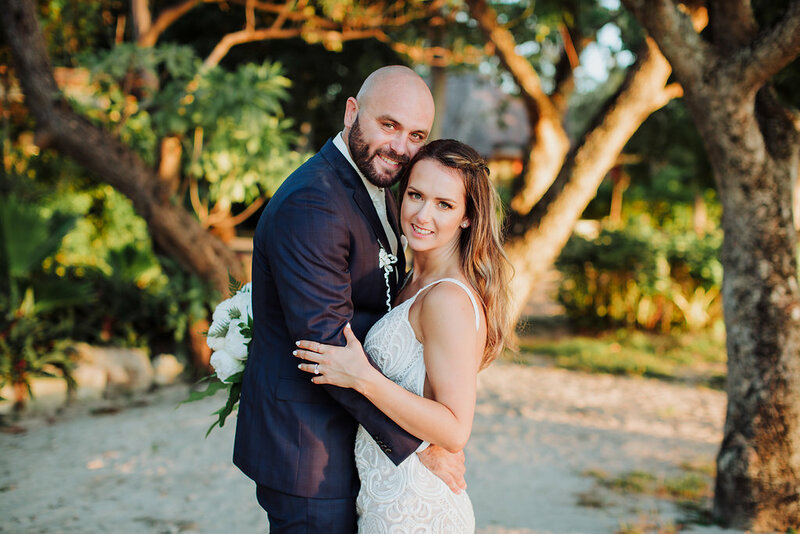 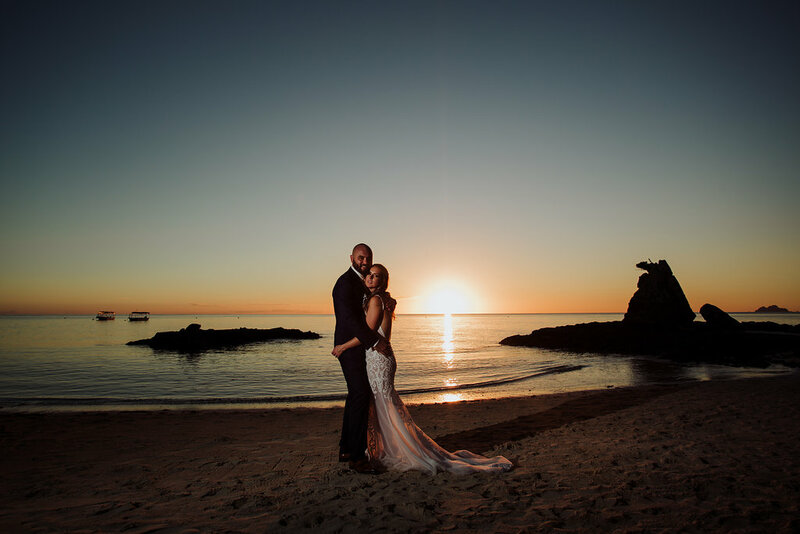 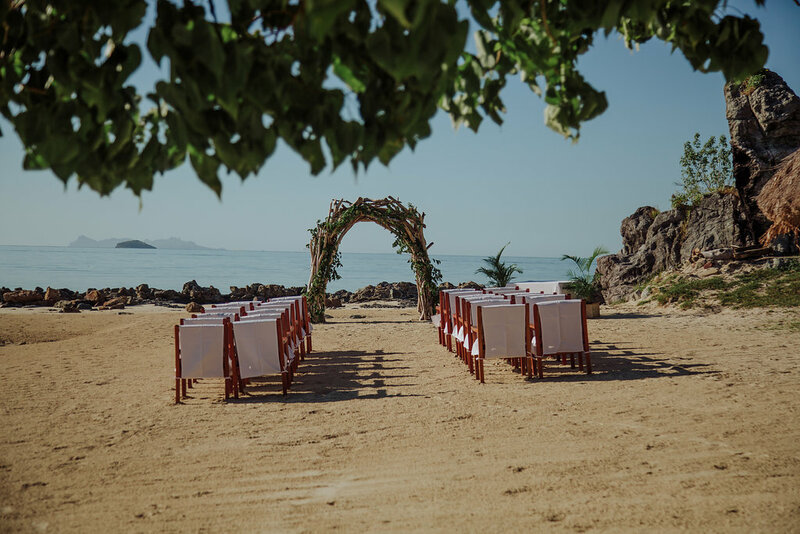 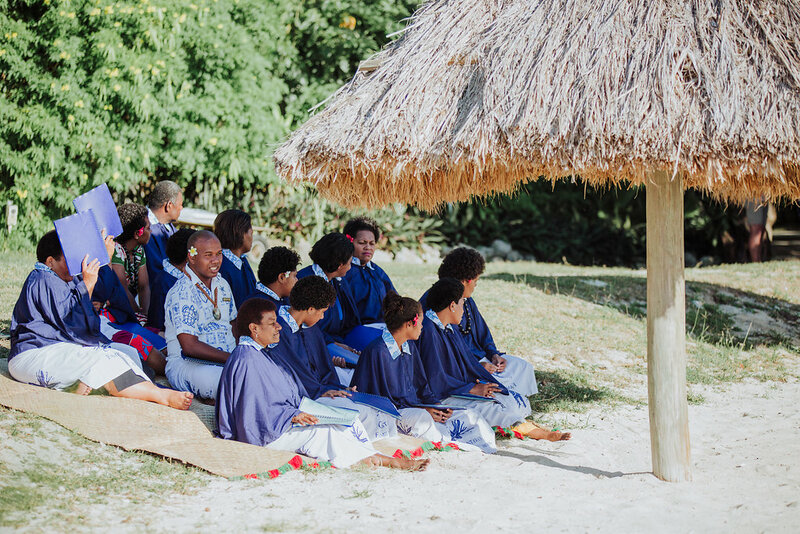 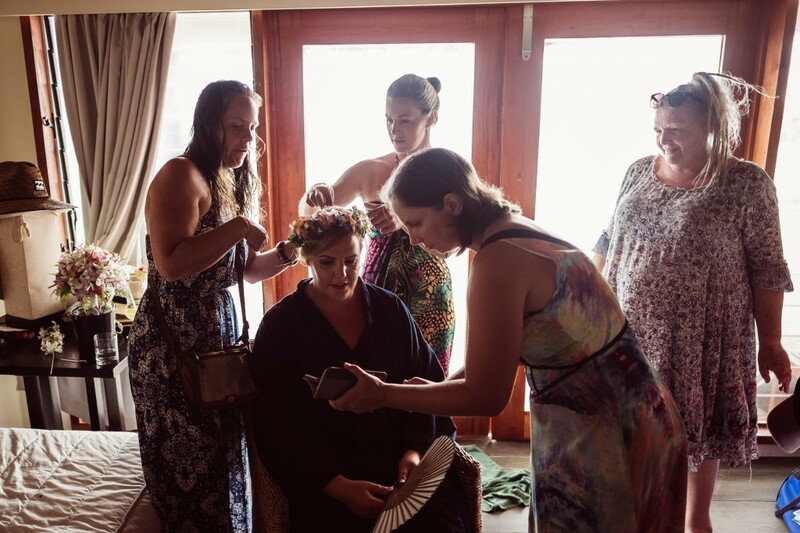 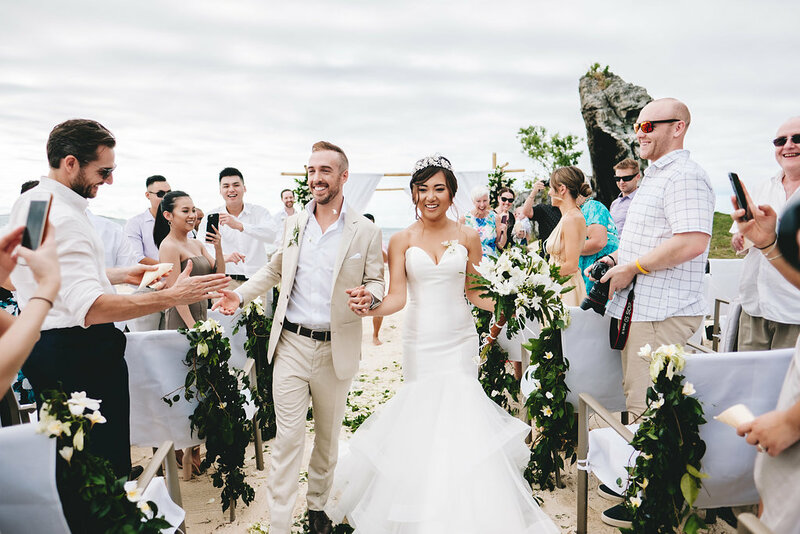 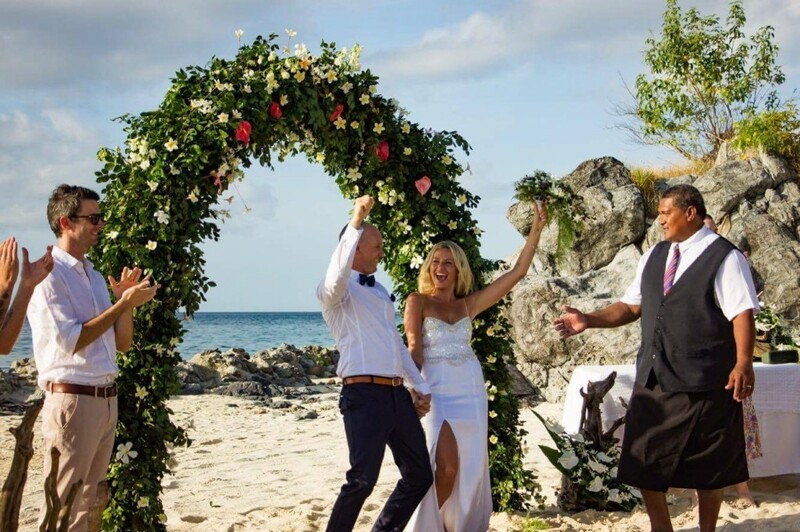 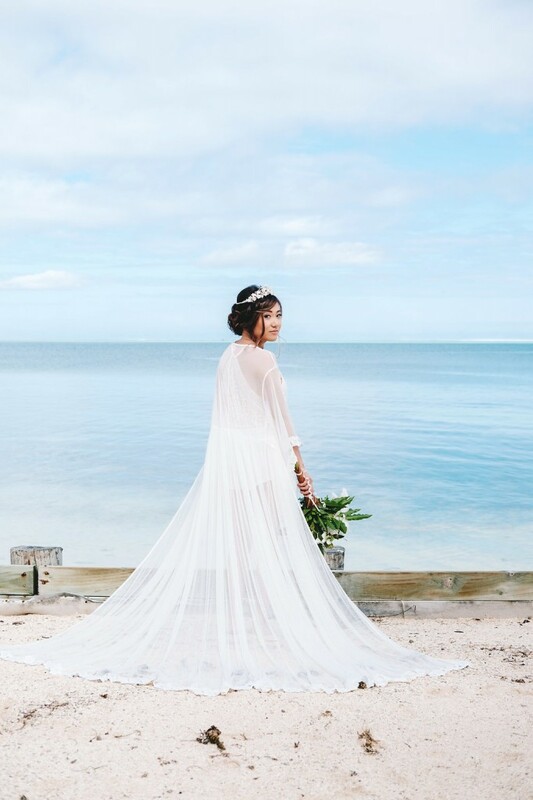 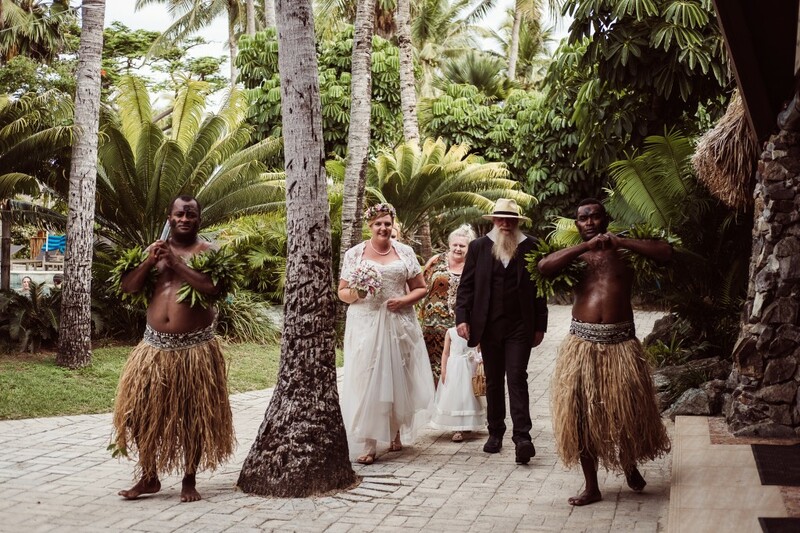 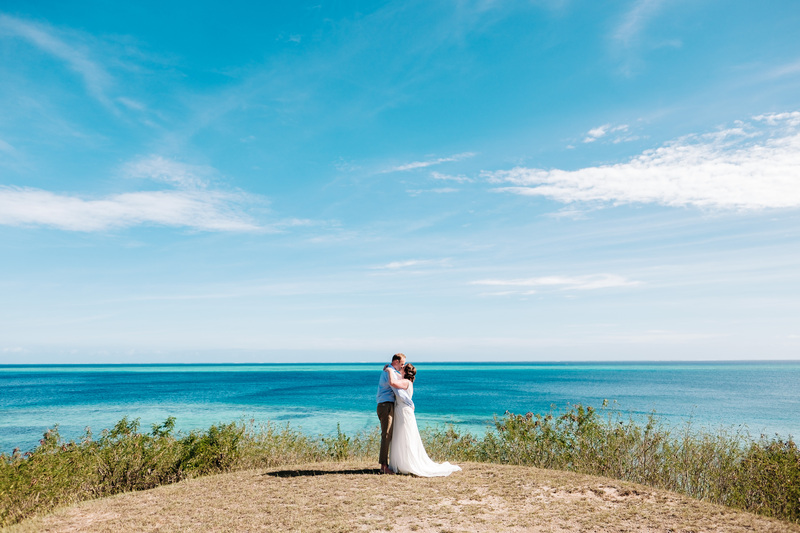 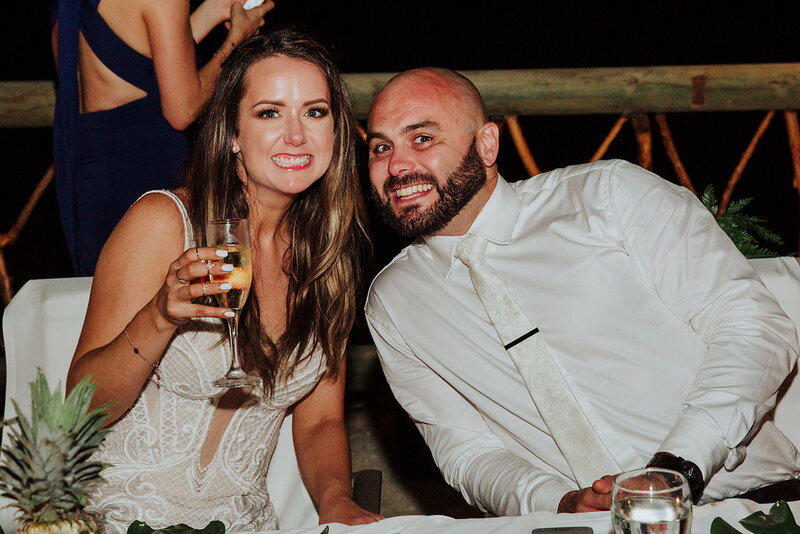 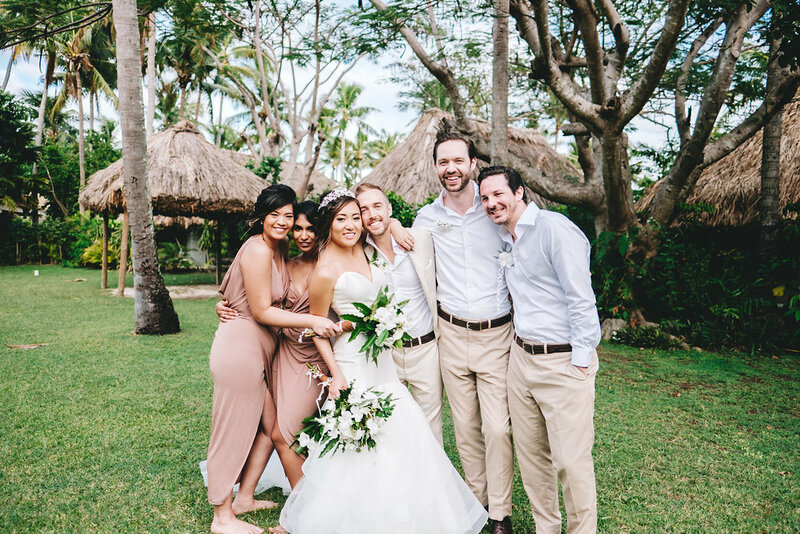 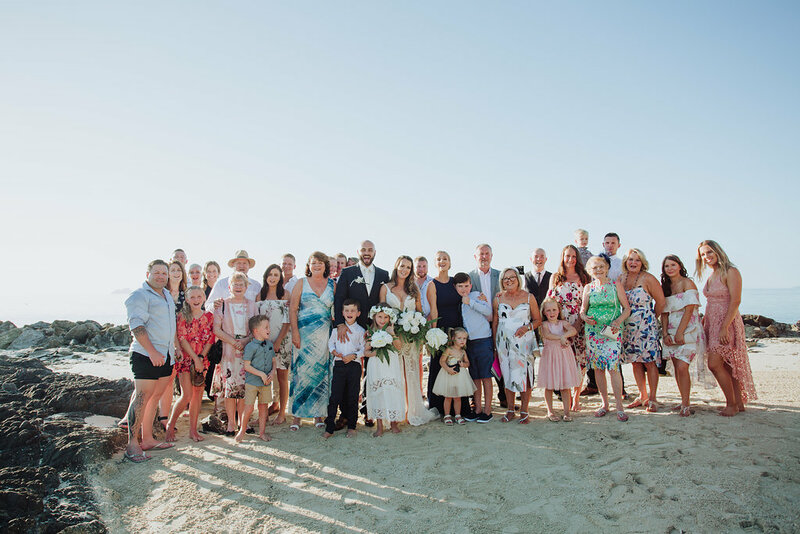 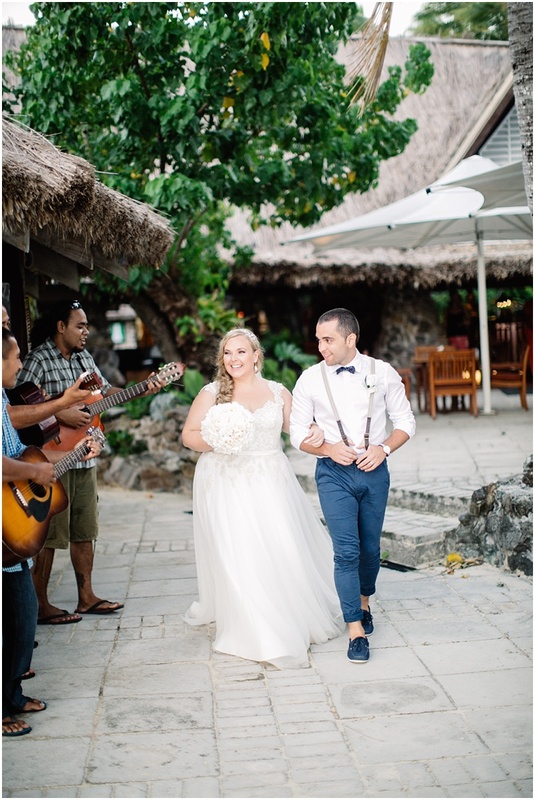 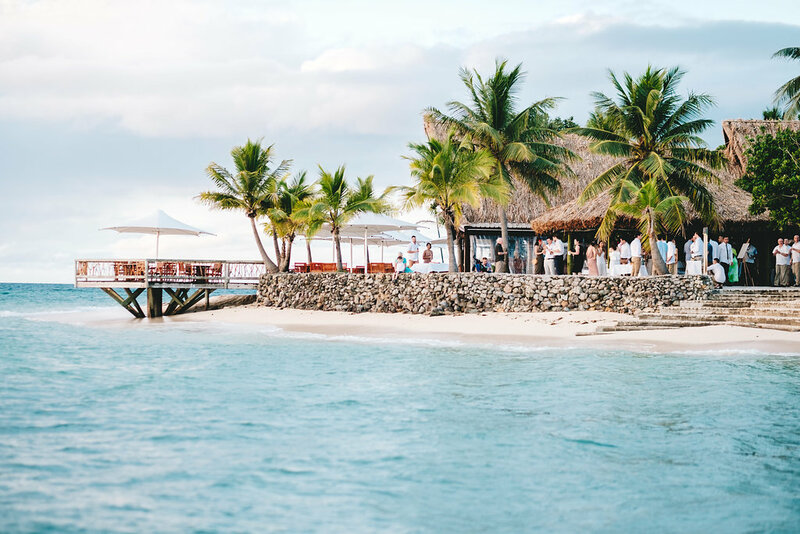 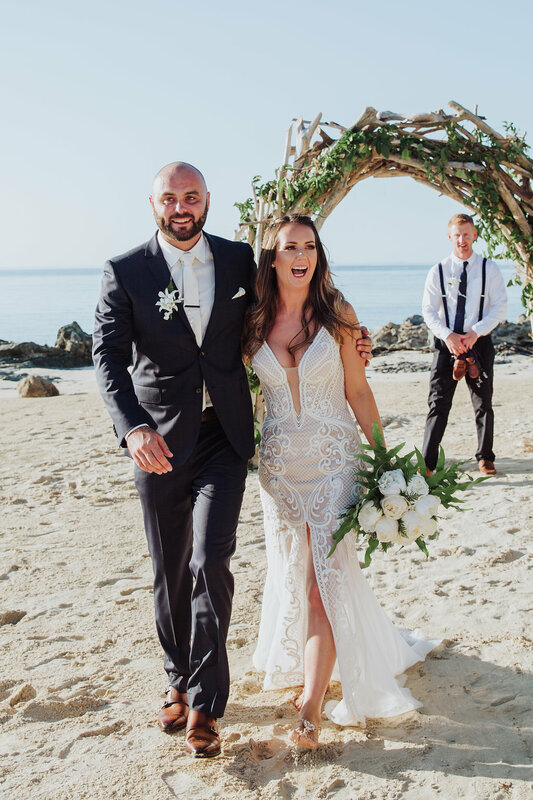 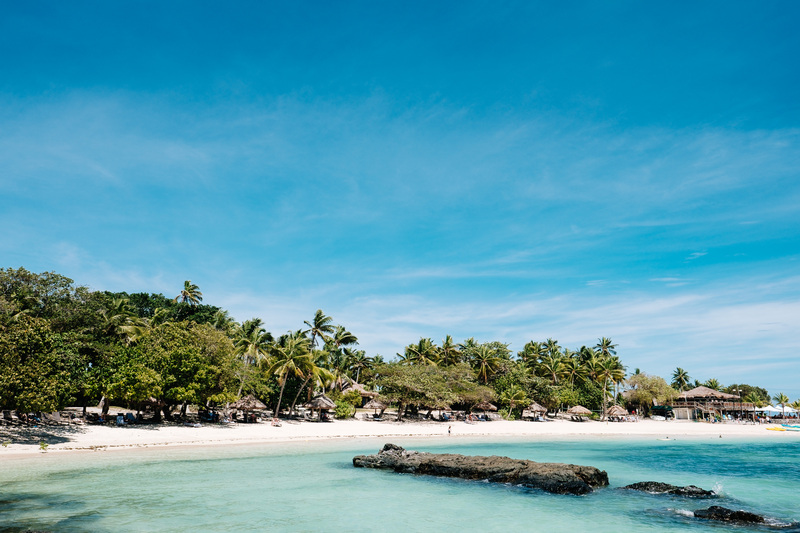 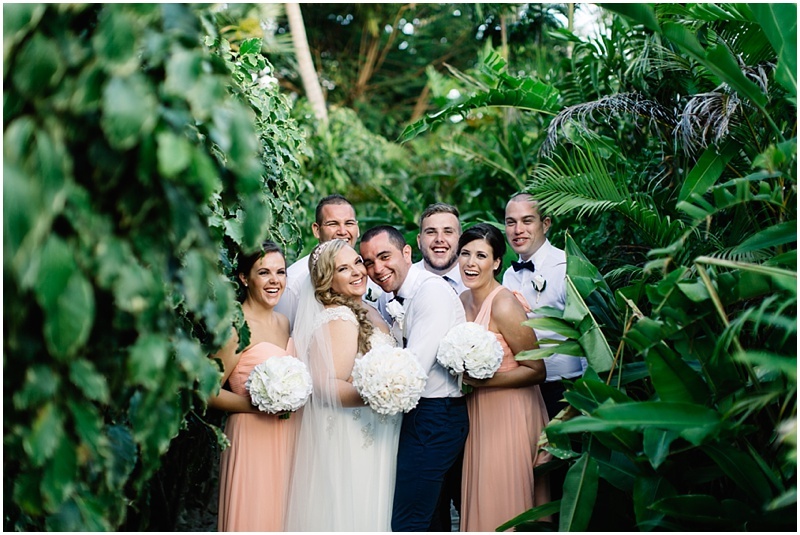 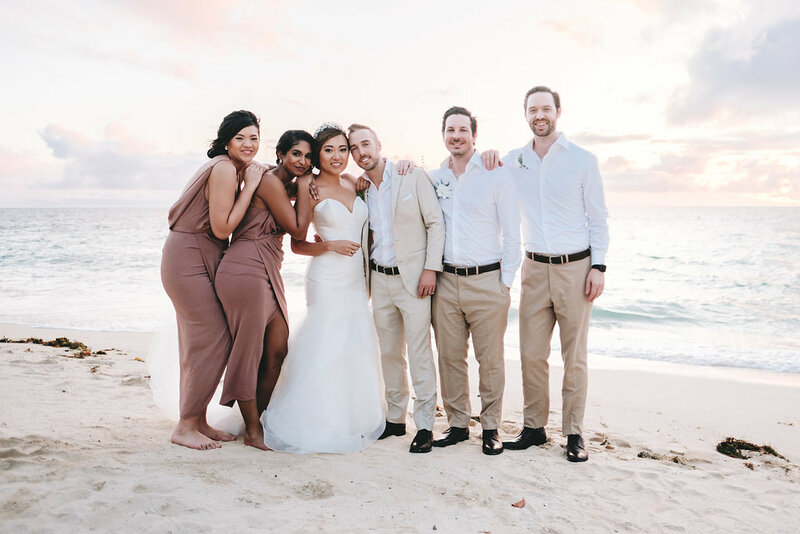 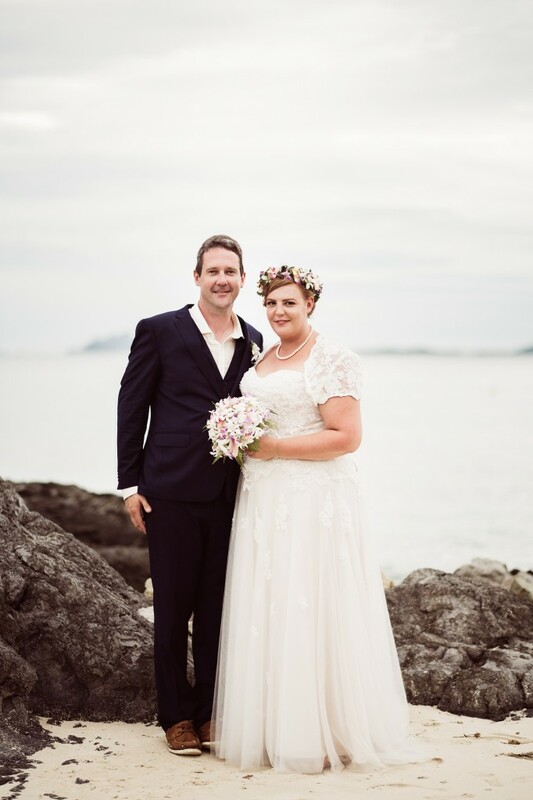 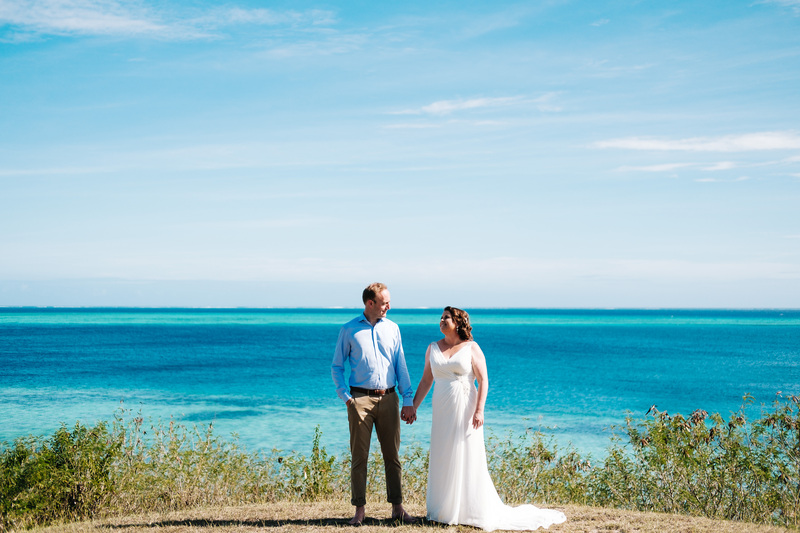 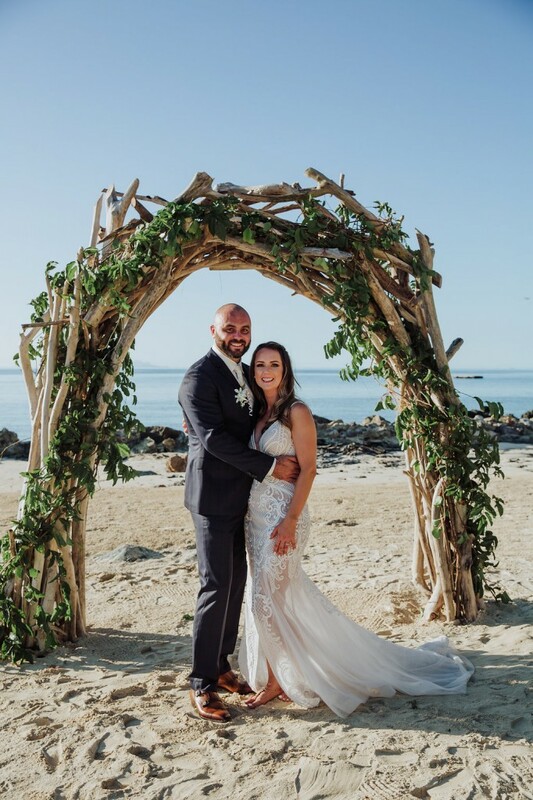 Cathlin & Daniel’s wedding was set on the stunning Castaway Island and they were joined by their close family and friends to celebrate this special day. 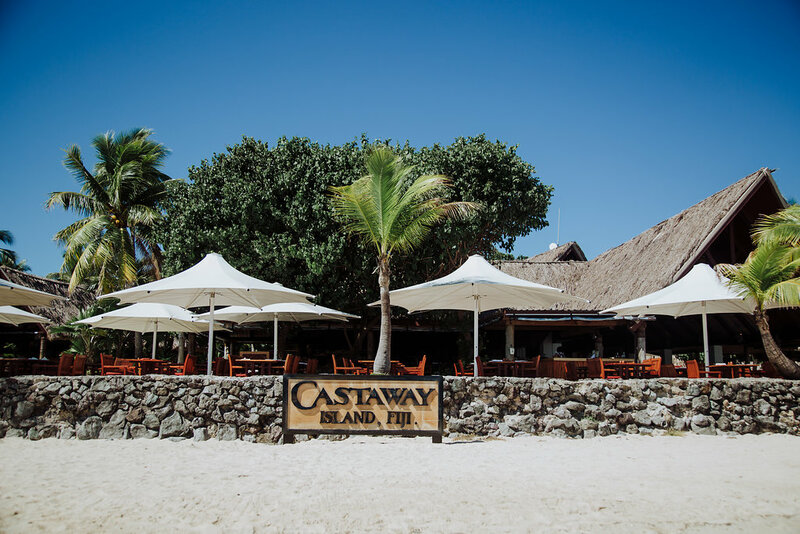 Castaway Island, what a perfect place for a wedding! 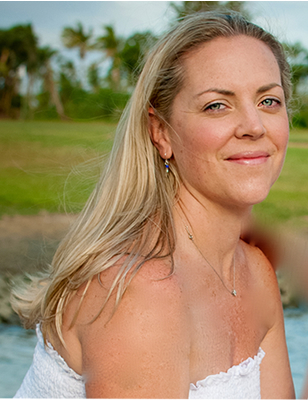 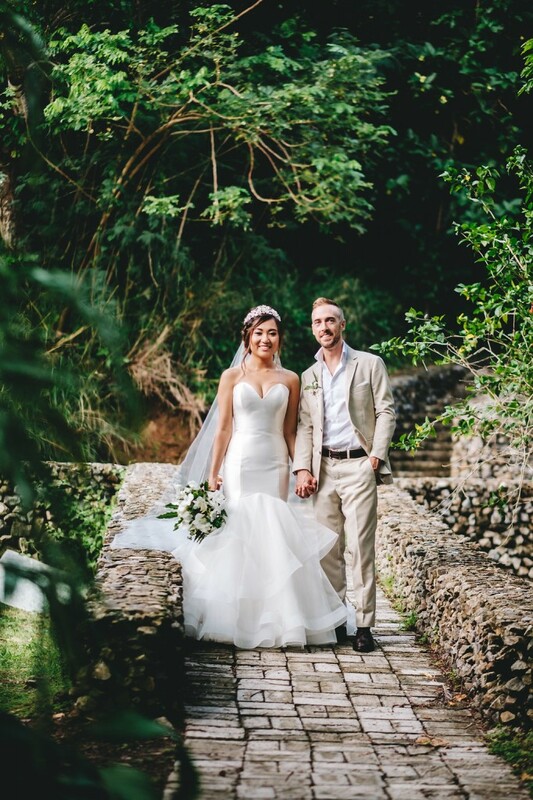 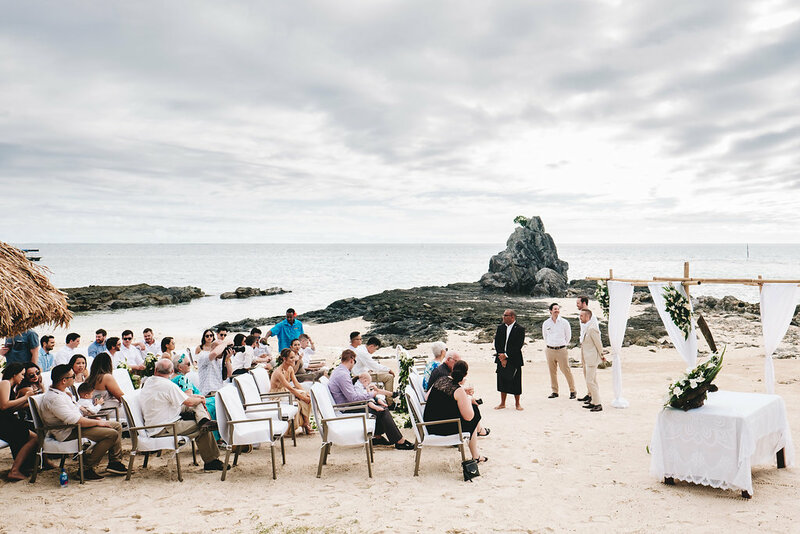 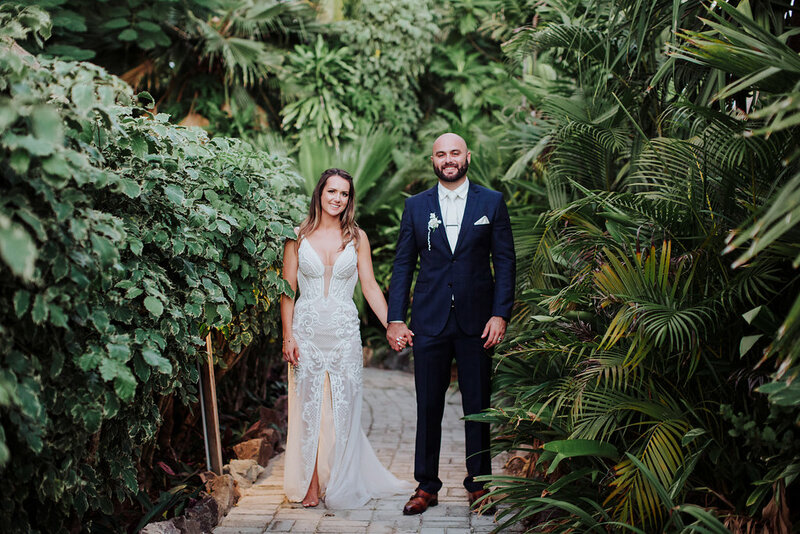 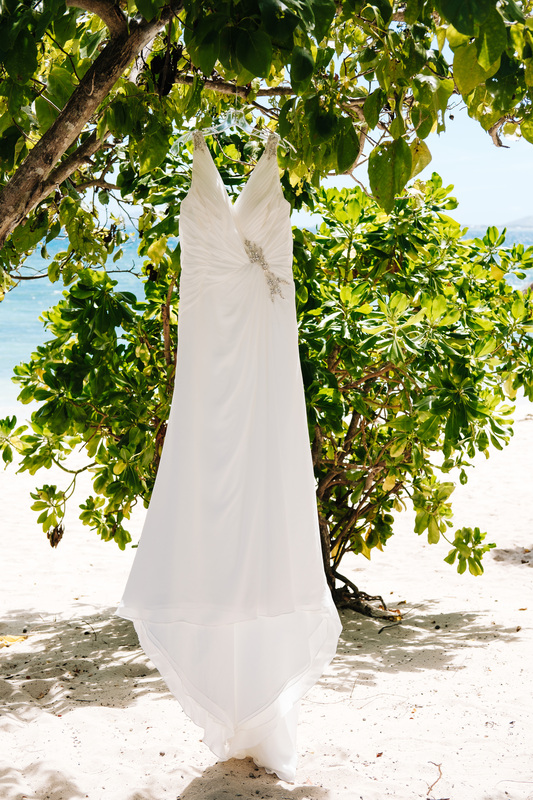 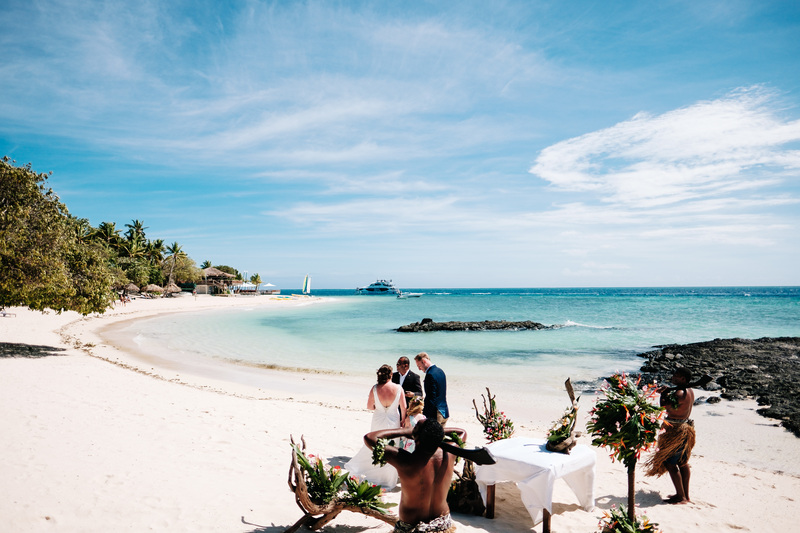 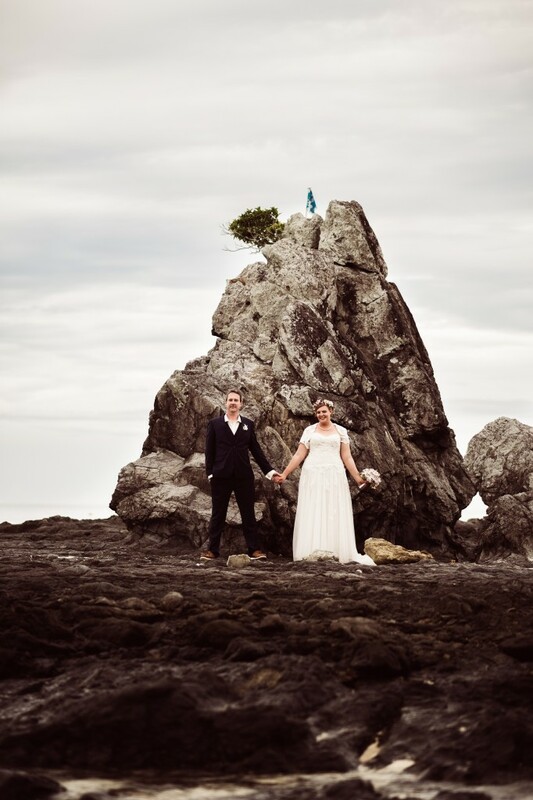 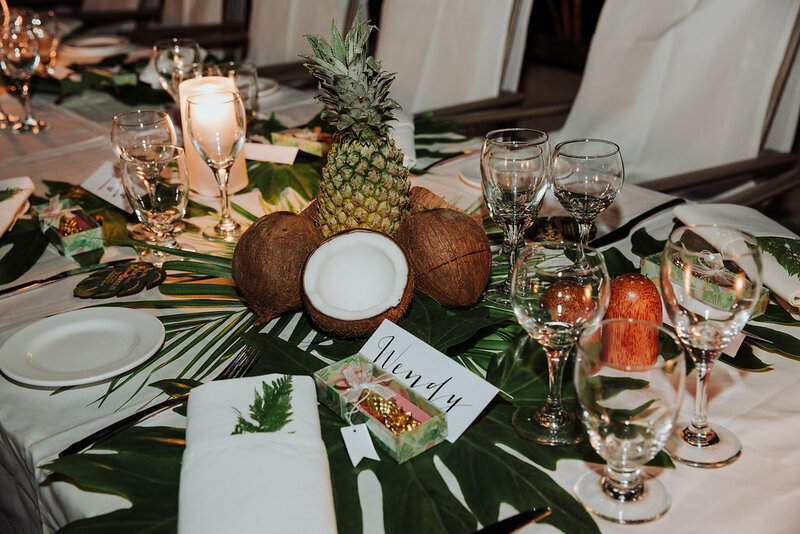 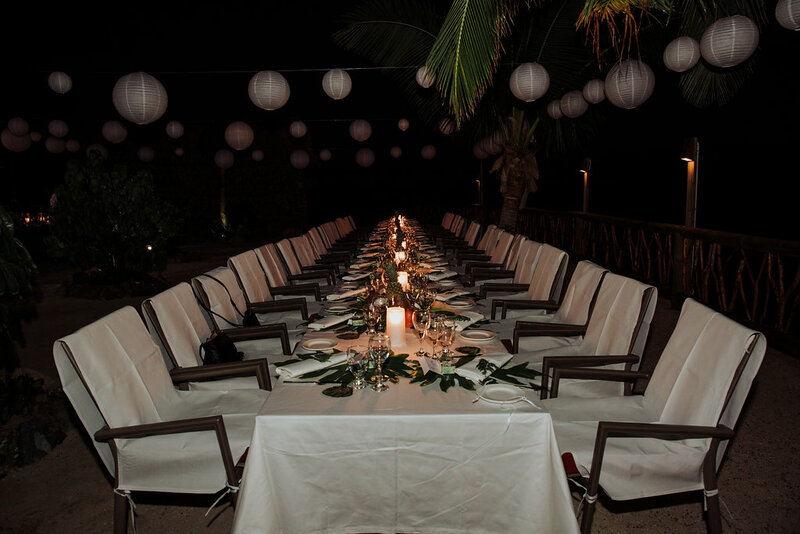 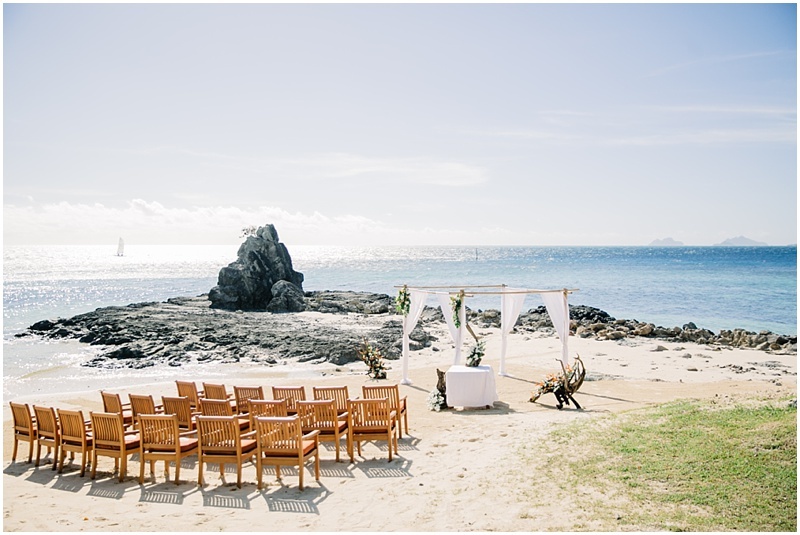 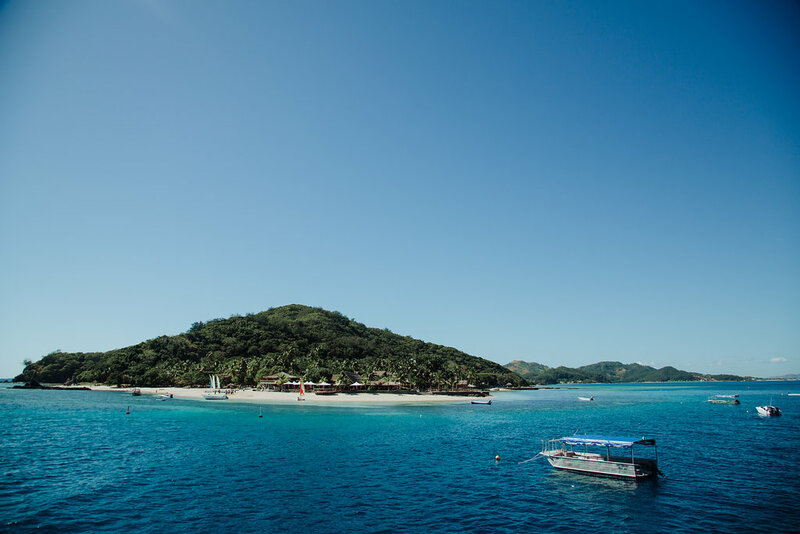 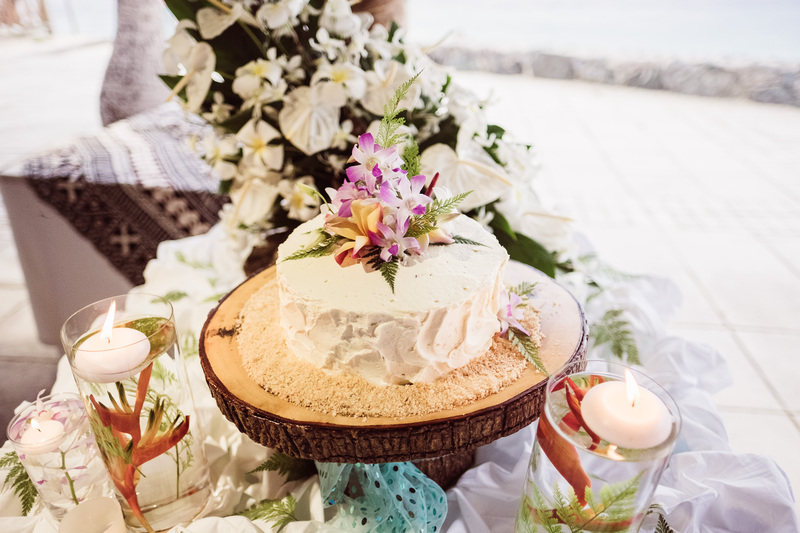 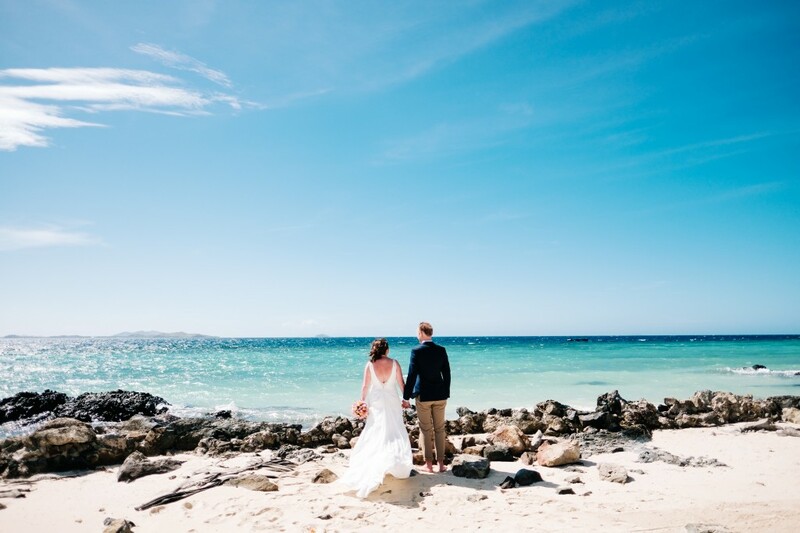 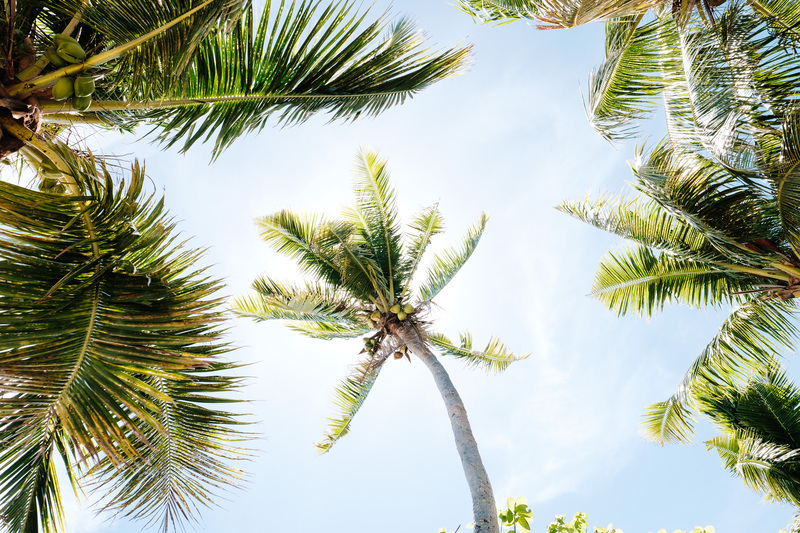 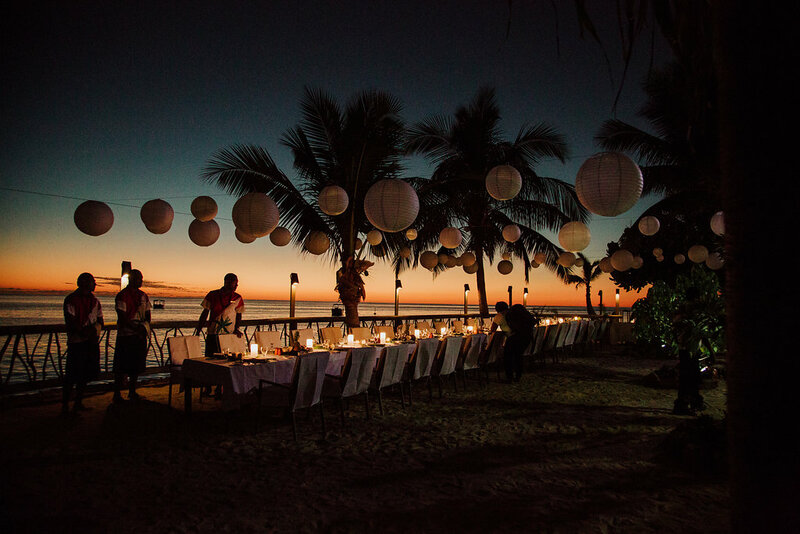 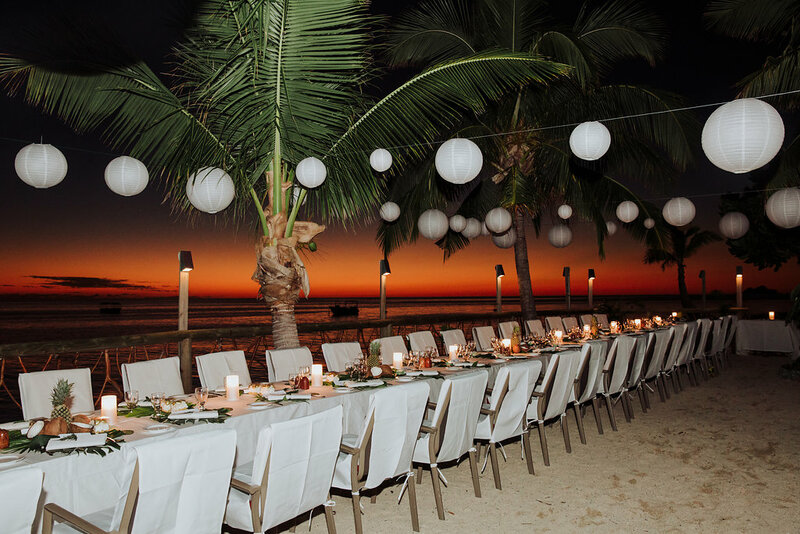 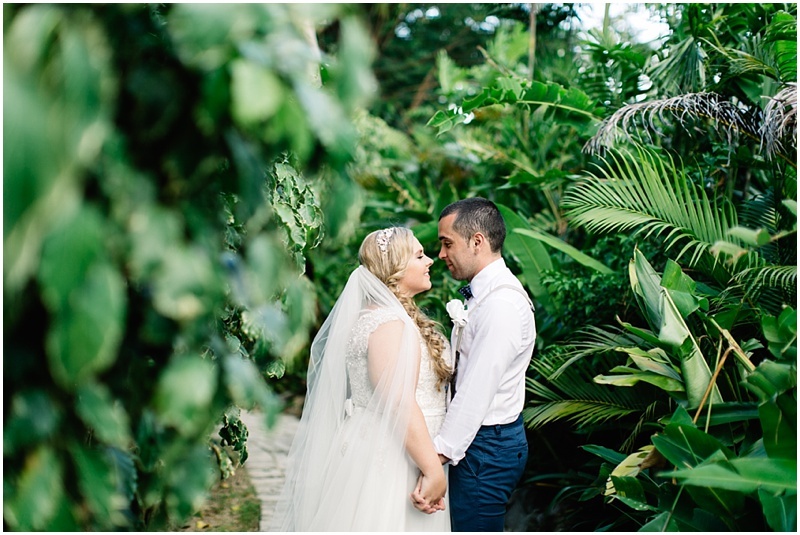 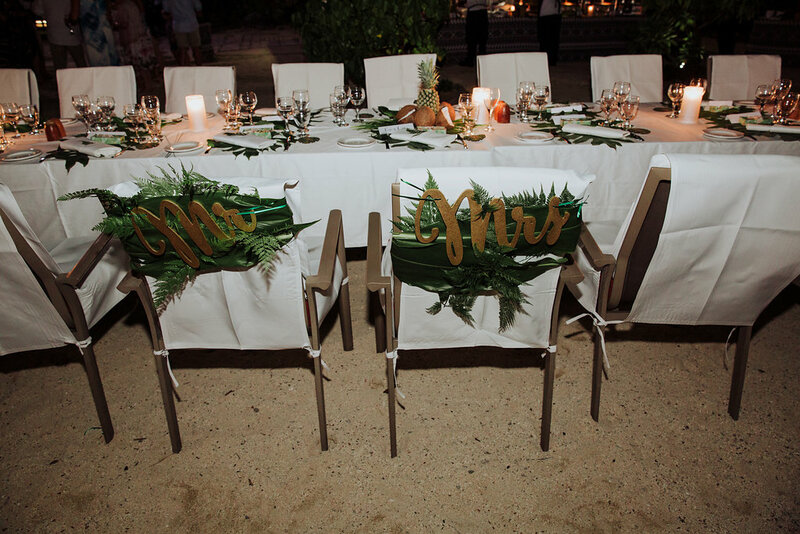 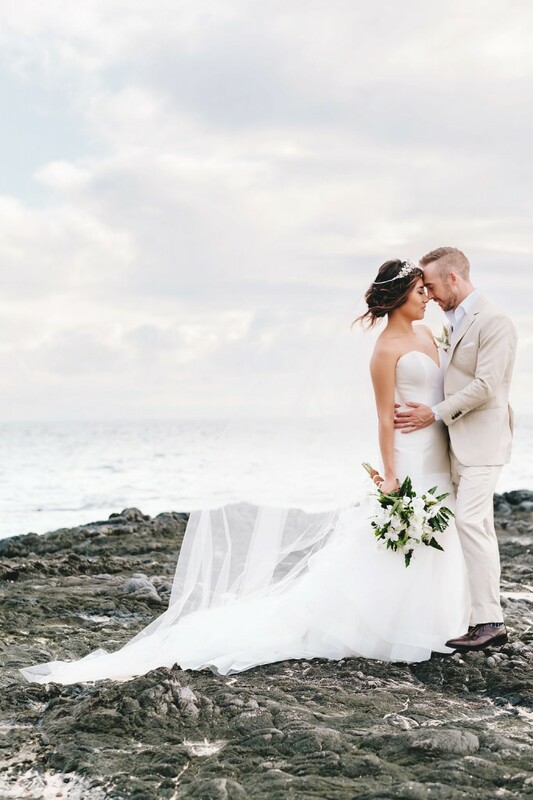 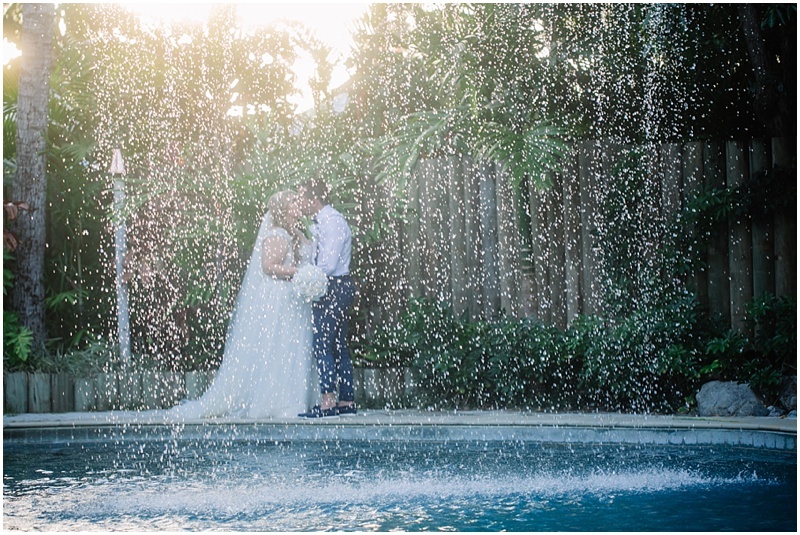 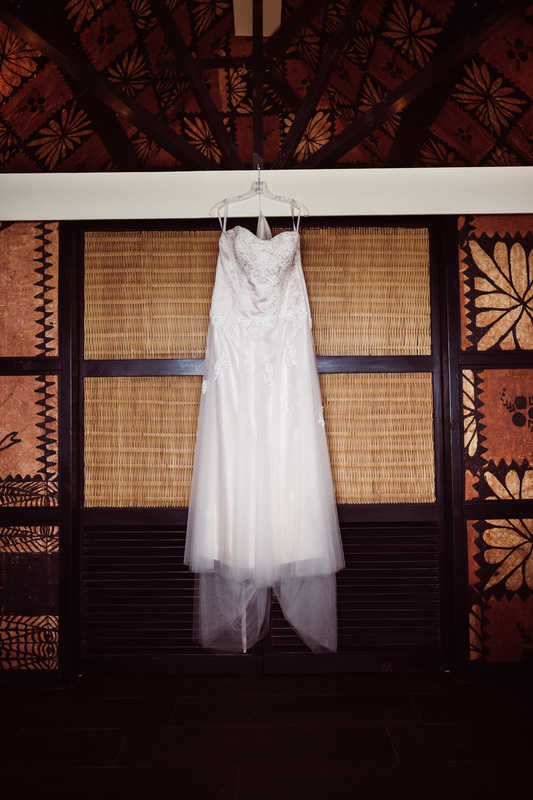 This pristine, private island was the ideal location for Melissa and Danny’s tropical wedding. 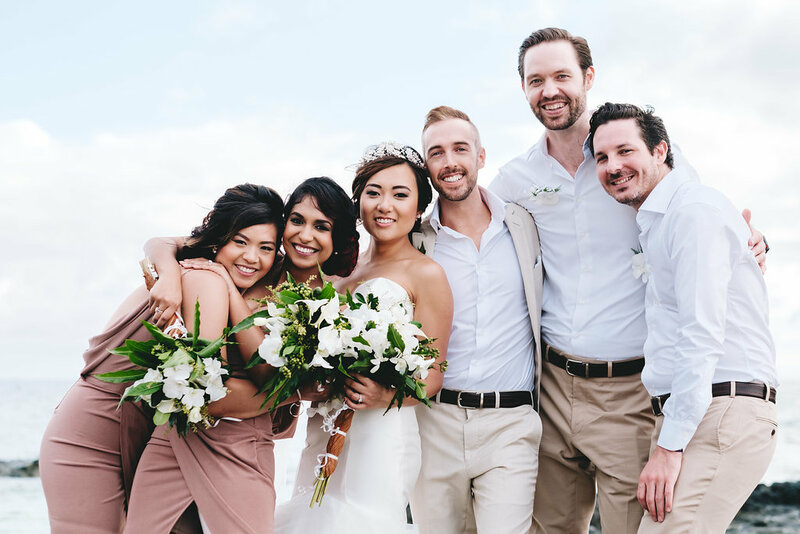 Melissa tells us how they met ‘We met through friends and became best friends. 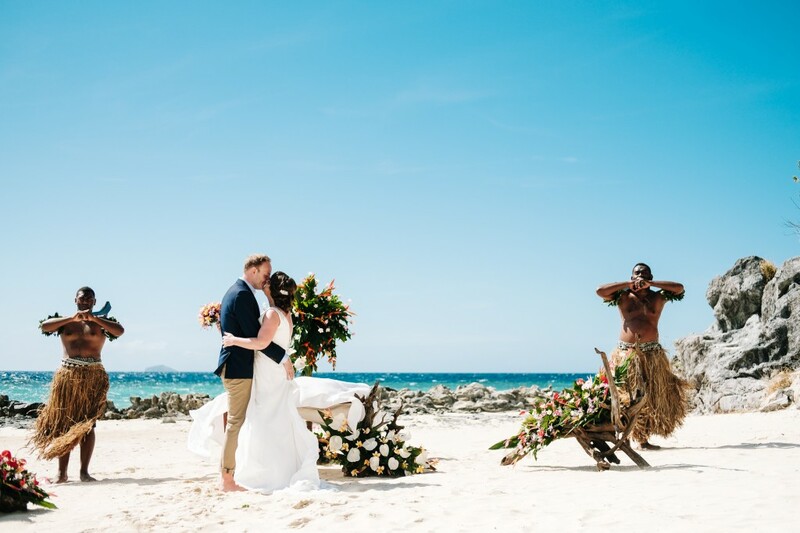 The rest is history!’ We loved helping these best friends create their dream day on Castaway Island. 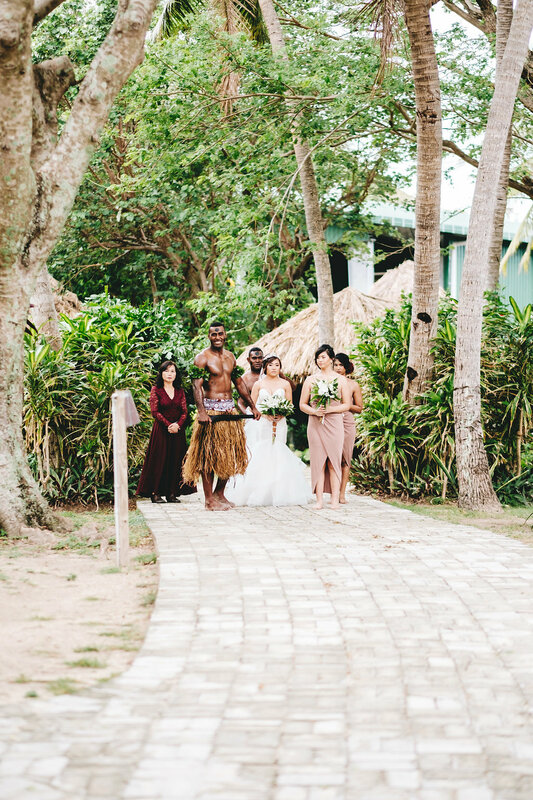 When their guests arrived on Castaway Island, Melissa and Danny had arranged for welcome bags to be waiting in their rooms. 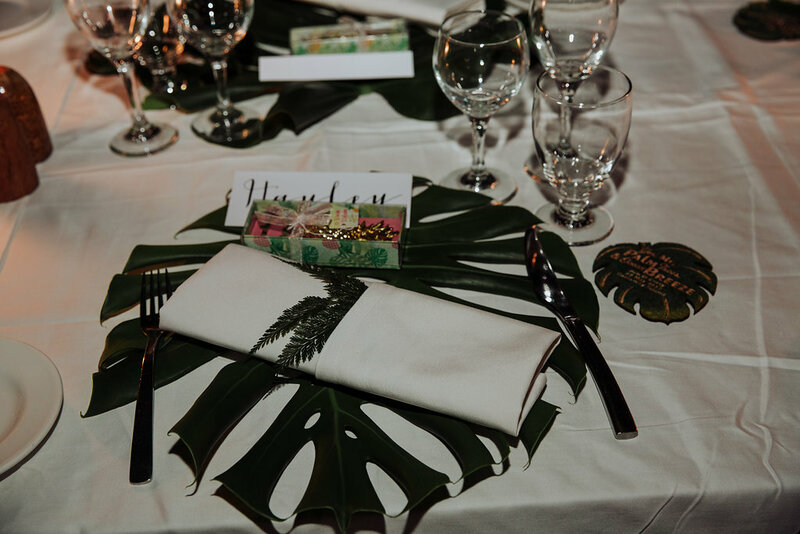 They filled them with snacks, drinks, Pure Fiji sunscreen, lip balm, insect repellant and playing cards. 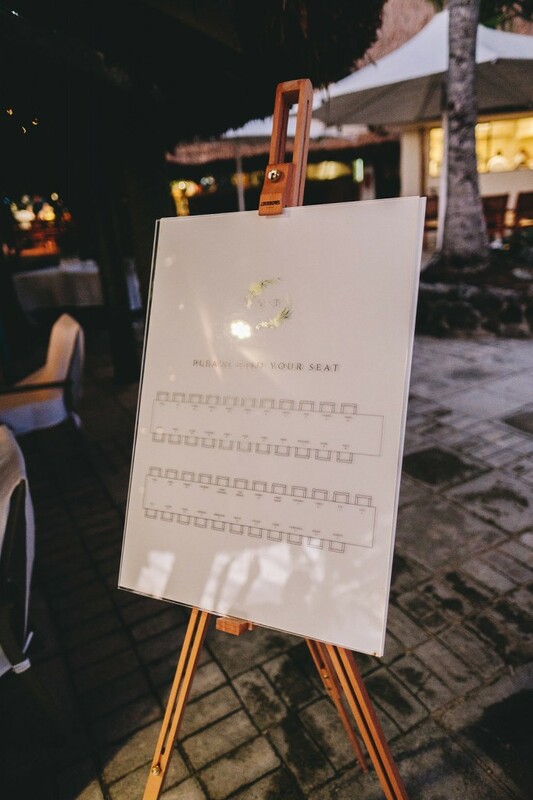 Such a special touch and a great way to greet your guests. 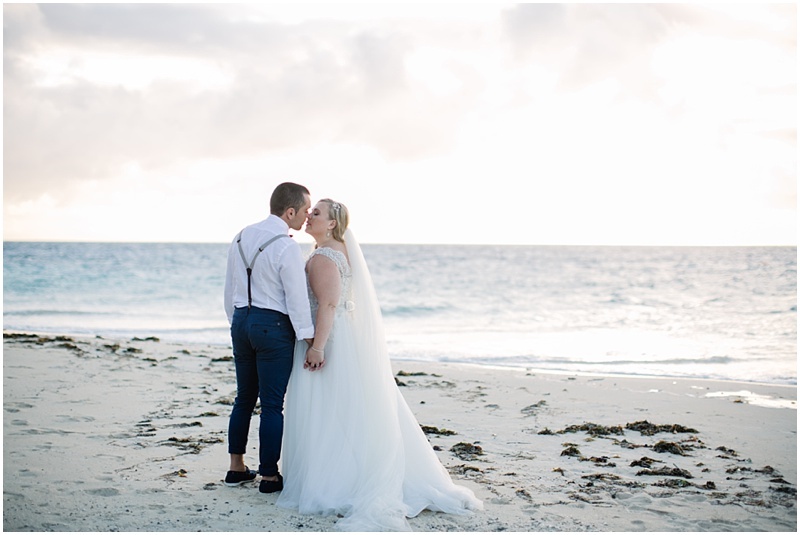 To start the celebrations, the couple organised for a big island themed sunset cocktail party the night before the wedding. 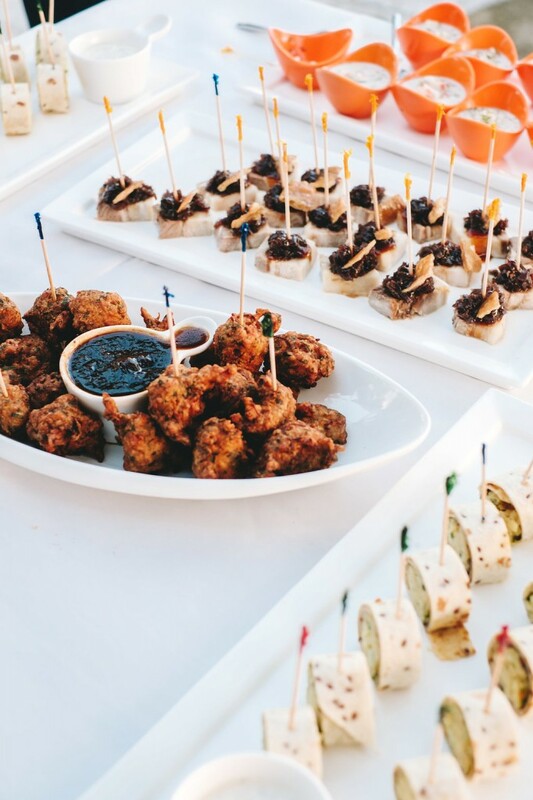 They enjoyed canapes and cocktails at sunset followed by many more cocktails and pizzas later in the night. 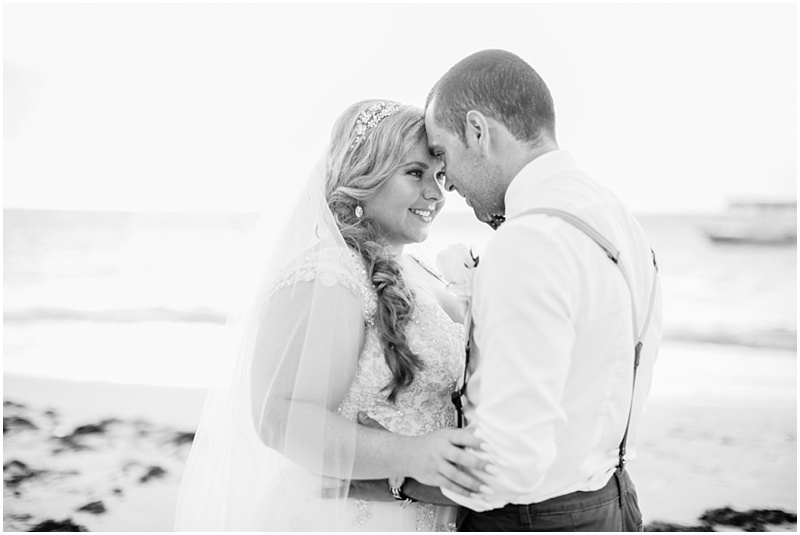 Melissa and Danny were married on the beach. 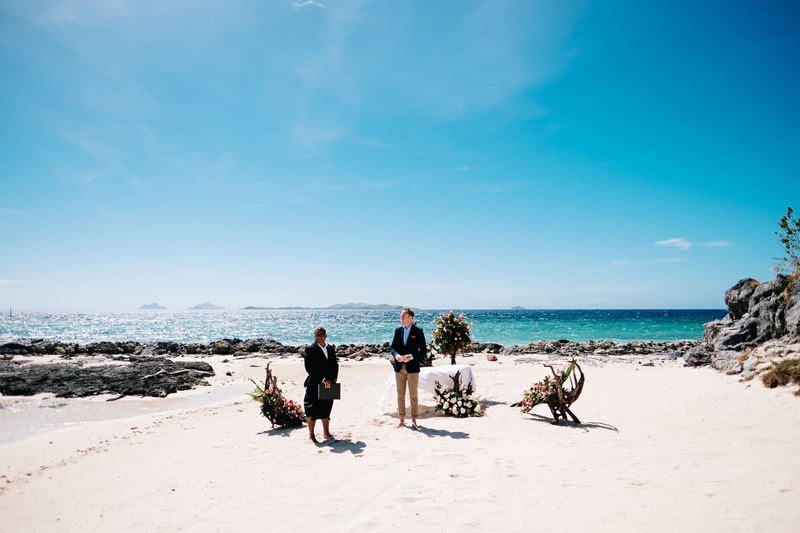 The location couldn’t have been any more amazing! 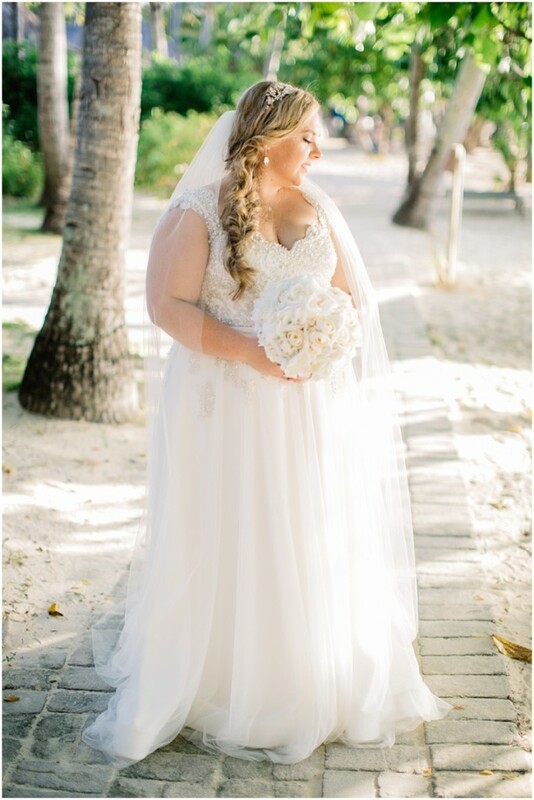 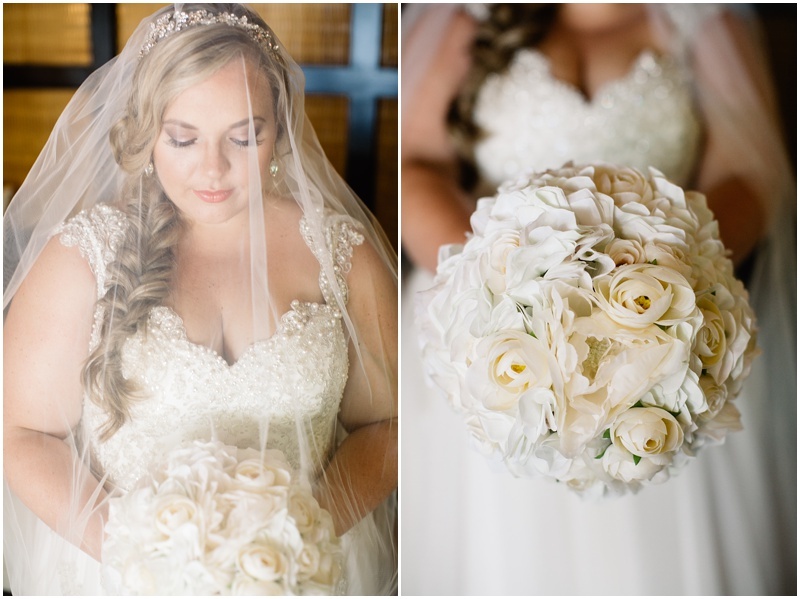 On the day, the bride looked beautiful in a custom dress By Norma Bridal Couture. 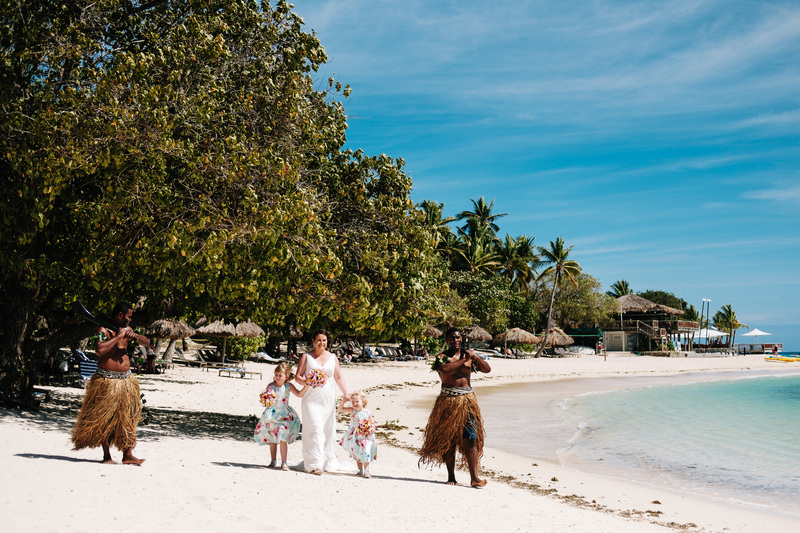 The bridesmaid wore gowns the Stella and Samara Gowns from Bridesmaids Only and the flowergirl wore a Lace and tulle dress from KingSoleil on Etsy. 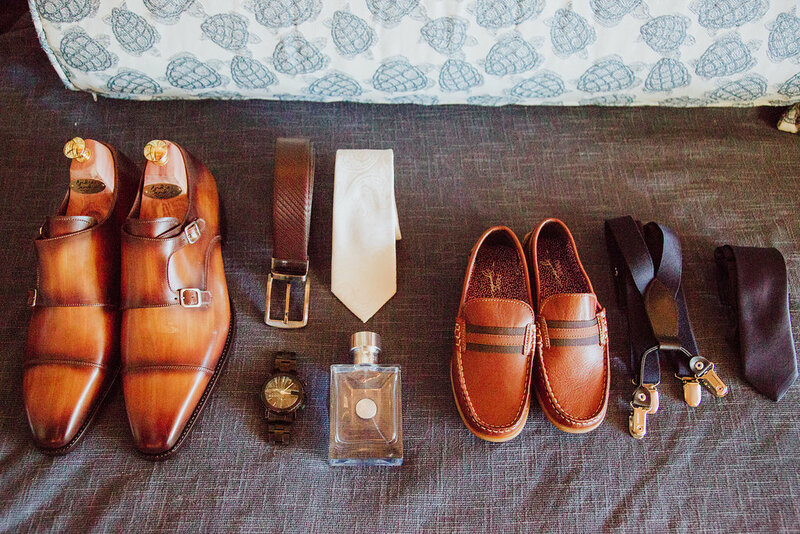 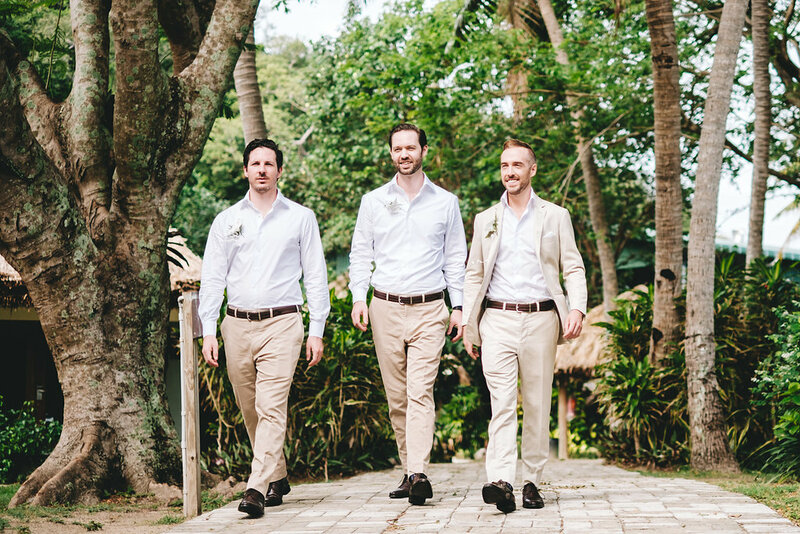 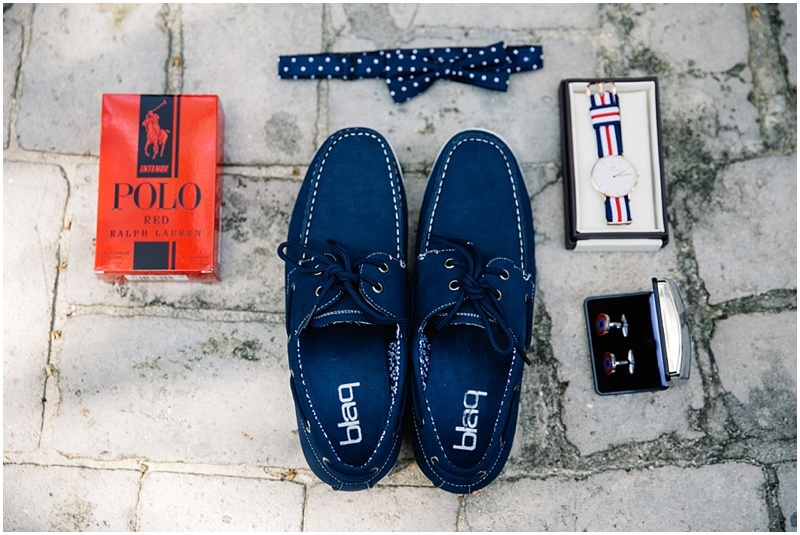 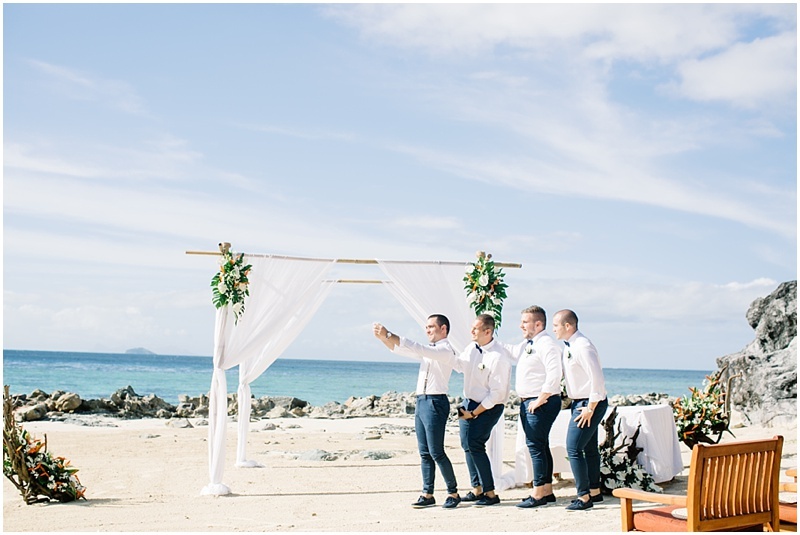 We love the casual beachside look of the groom and his groomsmen. 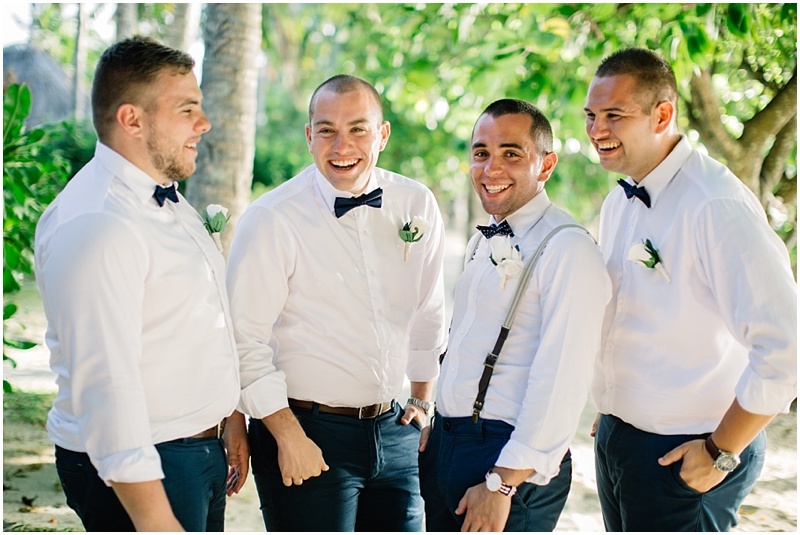 They all wore shirts and chinos from Industrie and bow ties from Roger David. 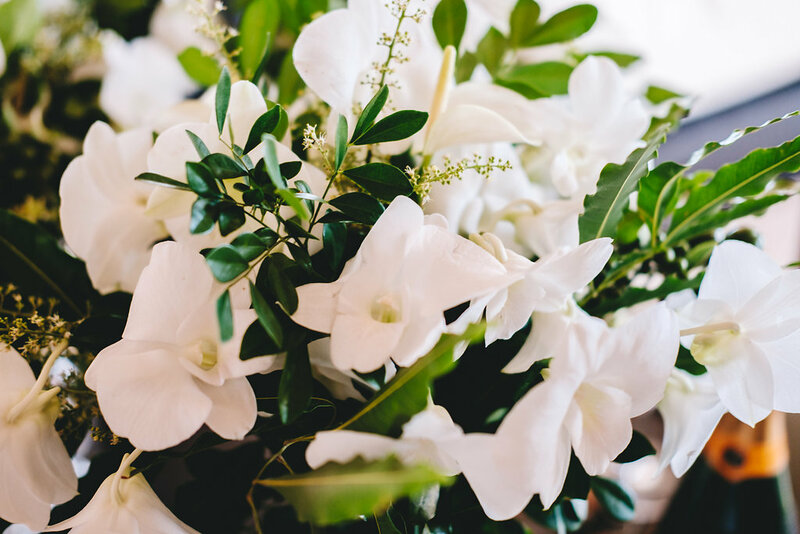 Melissa bought silk flowers by Silkflora in Petersham to decorate the tables for the reception and for the bouquets. 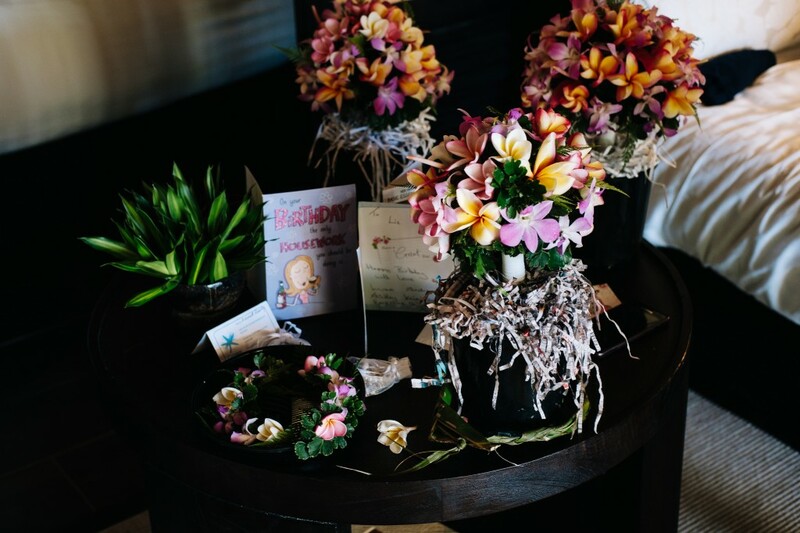 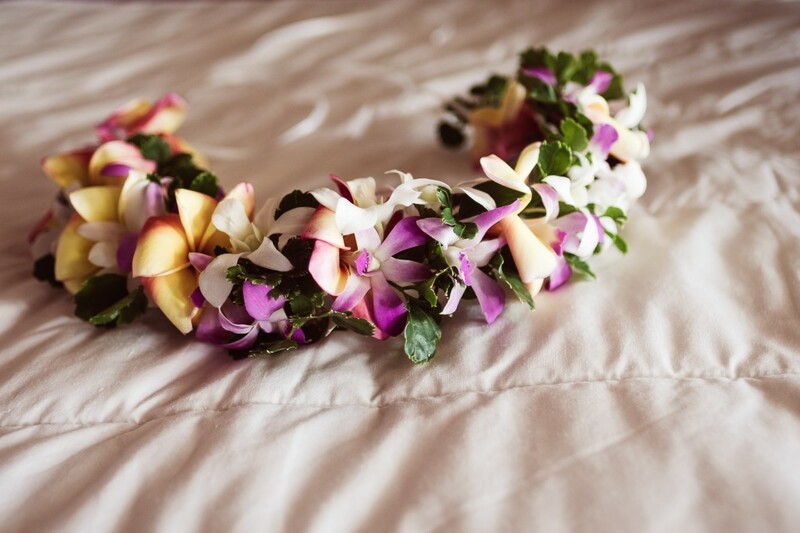 We think they look beautiful and what a great idea for when you can’t get the type of flowers you really want. 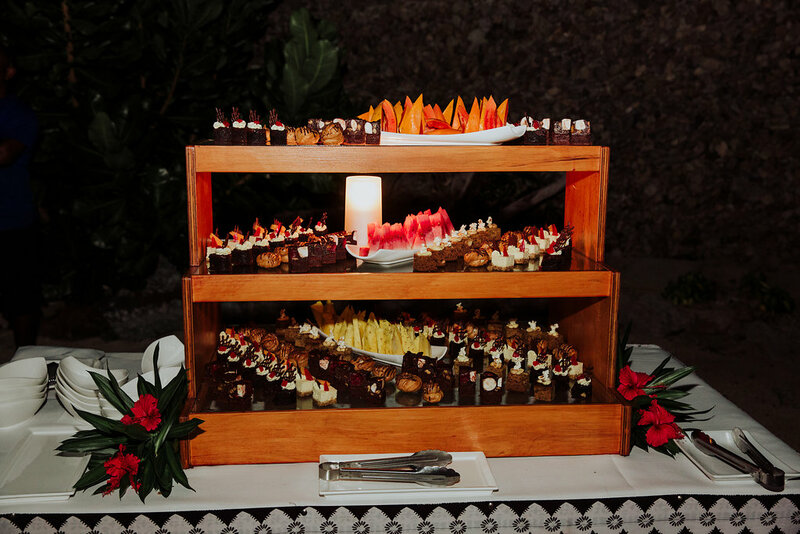 At the reception the guests enjoyed a seafood buffet followed by a two tier chocolate and caramel mud cake. 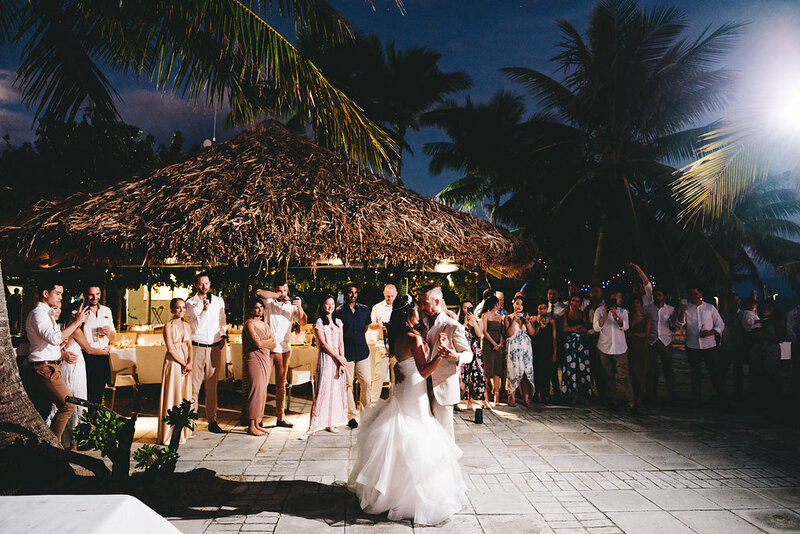 While the guests stayed at the bar and danced until dawn, Melissa and Danny snuck off to reminisce about their amazing day. 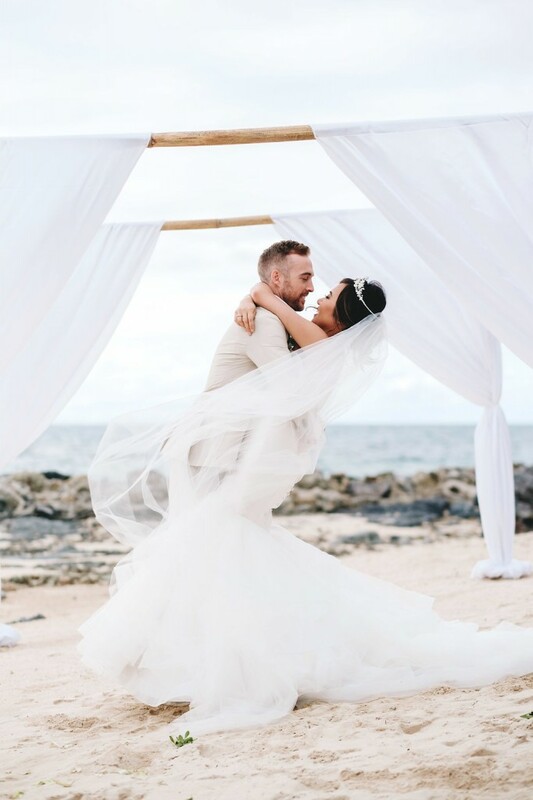 When we asked Melissa and Danny about their whole wedding experience Melissa says ‘Aside from marrying my best friend in paradise, seeing the smiles on our guests faces every day was so special to Danny and I. Castaway is truly the most magical place we’ve ever visited and we are so blessed to now be part of the Castaway family. 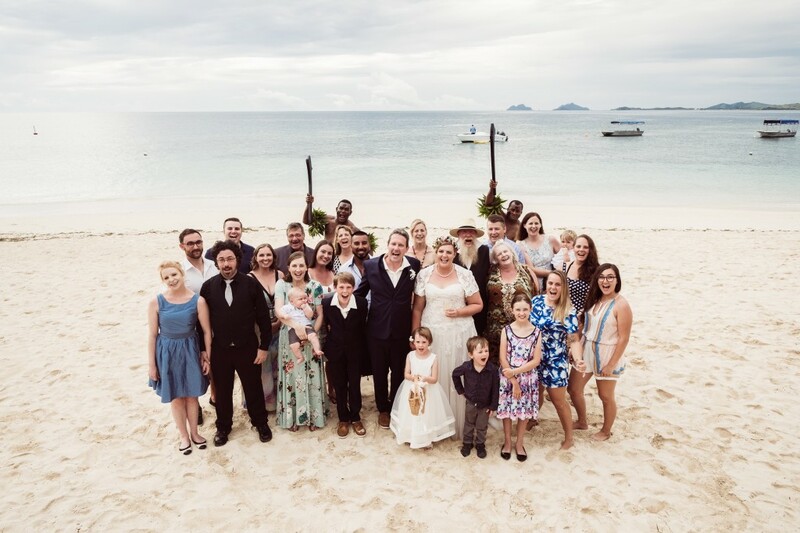 Nothing will ever compare to the experience we all shared together’. 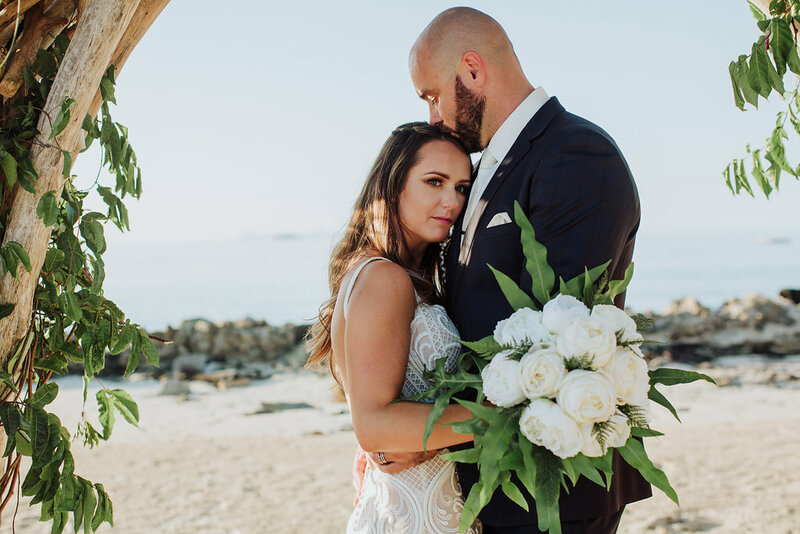 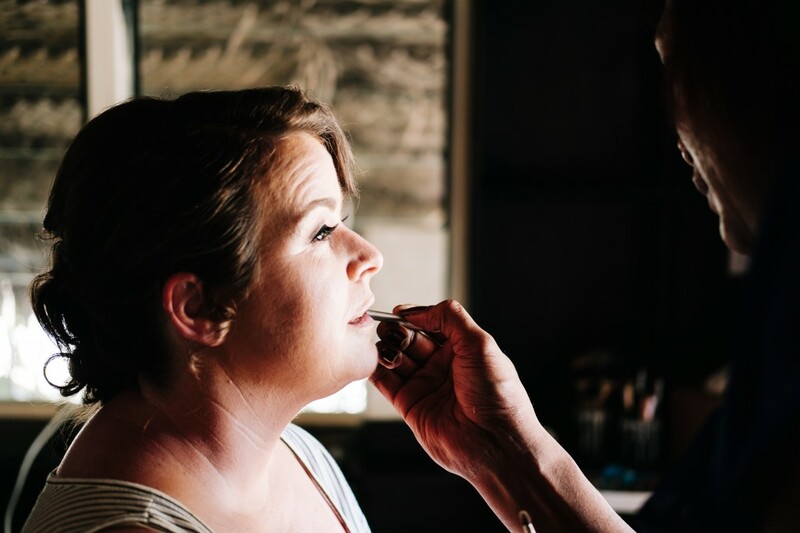 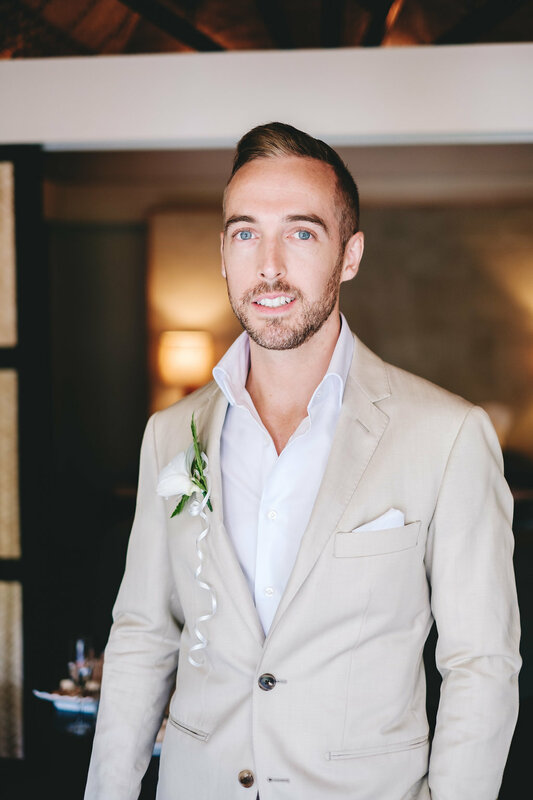 We were so thrilled to help Melissa and Danny create their perfect wedding day and Melissa says ‘The whole thing would have been a nightmare if not for the fabulous Chelsea!’. 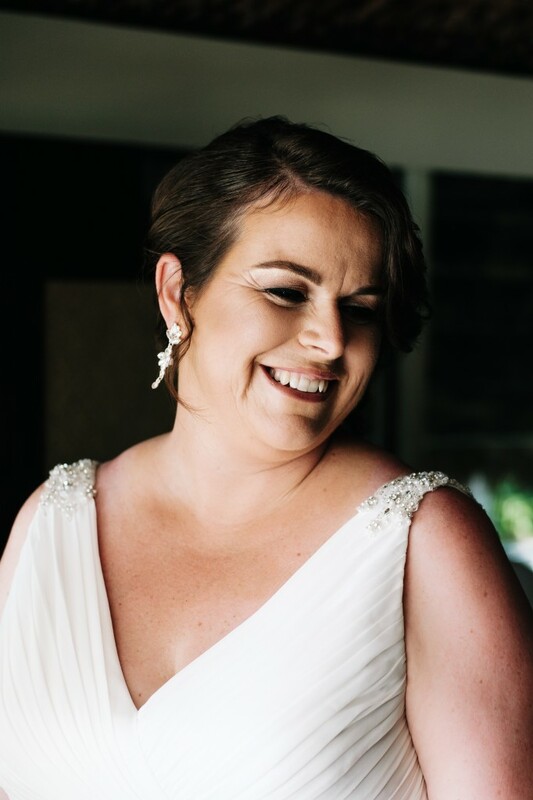 Thank you to Leezett Photography for the beautiful photos.